Born in Rhodes, Greece, to a Sephardic Jewish family, Soriano attended the College Saint-Jean-Baptiste there before emigrating to the United States in 1924. After settling with relatives in Los Angeles, Soriano enrolled in the University of Southern California's School of Architecture in 1929, from which he graduated in 1934. 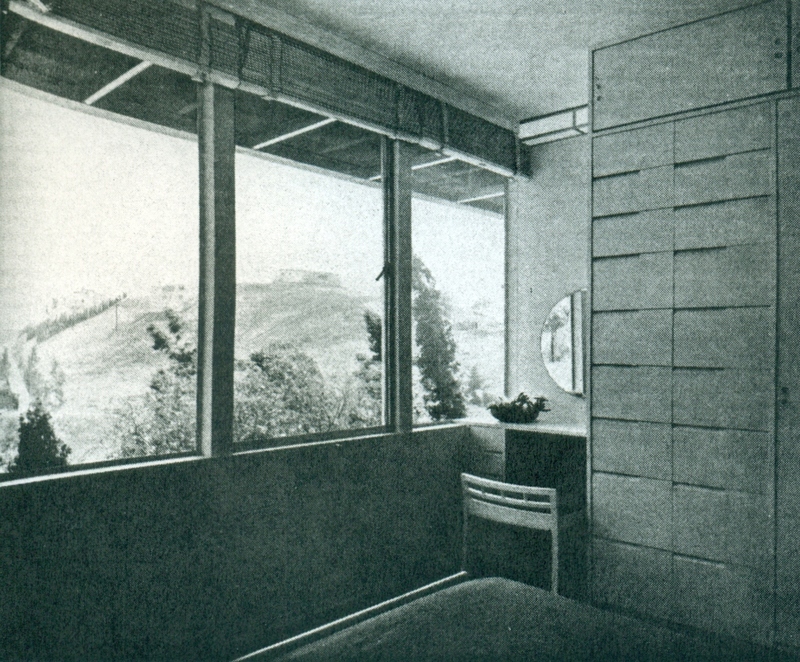 In 1930 Soriano became an American citizen and in 1931 he secured an internship with Richard Neutra, working alongside fellow interns Gregory Ain and Harwell Hamilton Harris. 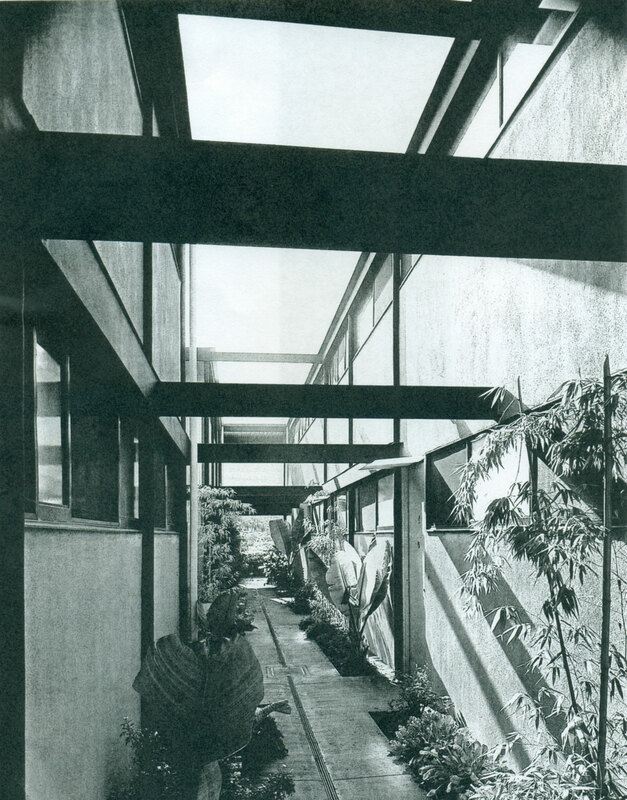 This was followed by a brief internship with Rudolph Schindler in 1934 then Soriano quickly returned to his unpaid position at Neutra's office. With America in the midst of the Depression, Soriano managed to find work with the County of Los Angeles on several WPA projects. 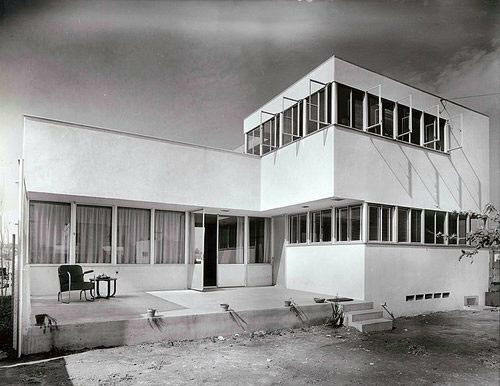 By 1936 he completed his first independent commission, the Lipetz house, which was included in the 1937 Paris International Architectural Exhibition. 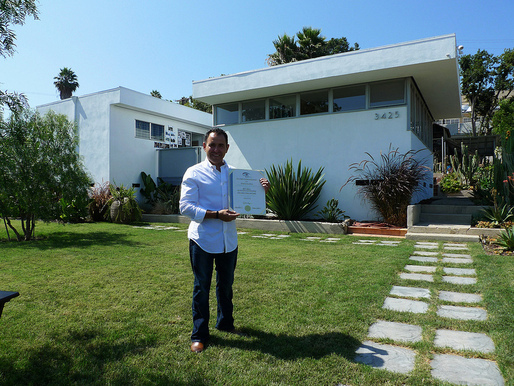 With U.S. residential and commercial construction largely curtailed by America's involvement in the World War II, Soriano took up lecturing at USC and contributing designs to various competitions featuring proposals for post-war housing. 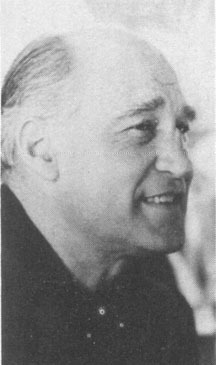 In 1953 Soriano relocated from Los Angeles to Tiburon CA where he lived with his wife Elizabeth (Betty) Stephens and her two daughters Margaret and Lucille Coberly. 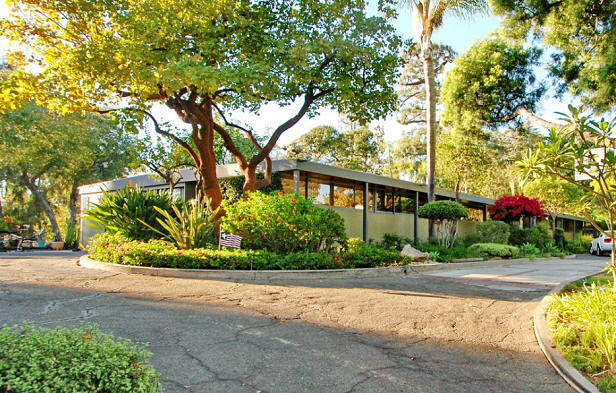 By 1955 Soriano designed the first mass-produced steel house, built by developer Joseph Eichler. Their work won two awards from the AIA Northern California Chapter. The last designs of Soriano's to be built were eleven All Aluminum Homes on Maui in 1965. From 1970 to 1988 Soriano focused on traveling the world as an architectural lecturer, writer and researcher. He won an AIA Distinguished Achievement Award and the USC Distinguished Alumni Award, both in 1986. Shortly before his death he served as a Special Sessions Instructor at the College of Environmental Design at Cal Poly Pomona. His archives are there now. Biography adapted from Wikipedia. Many thanks to Catherine Westergaard Cramer for her extensive research. About 1935 - Dormitory for 50 Unemployed Men for the Regional Planning Commission of Los Angeles County, Los Angeles CA. 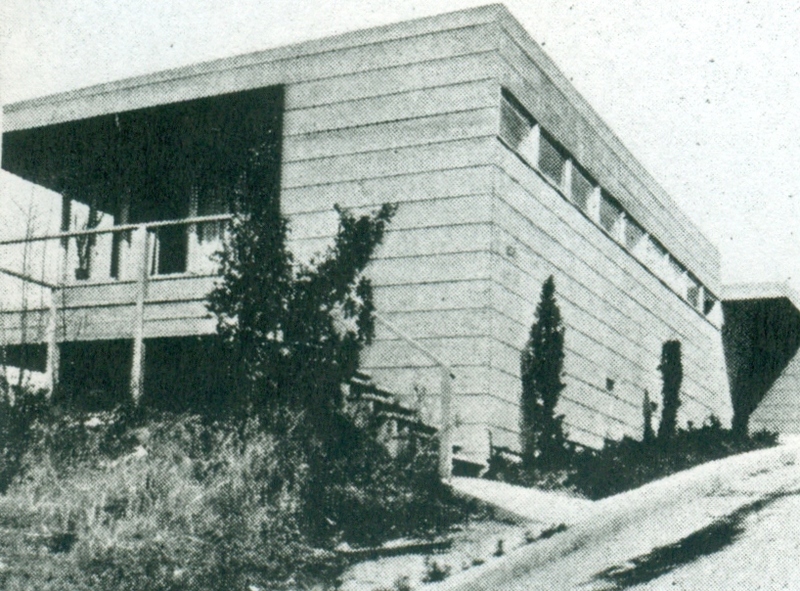 This unbuilt dormitory was Soriano's second project for the Work Progress Administration. He designed a Community Theater for Los Angeles in 1935 that was also unbuilt. 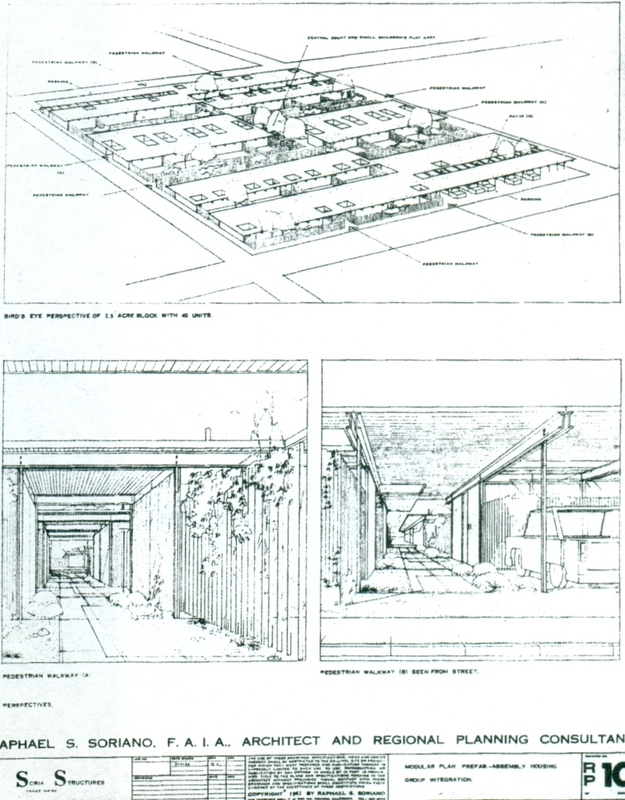 1936 - Indigent Housing Project, City of Los Angeles Regional Planning Commission. Unbuilt. His third WPA project. 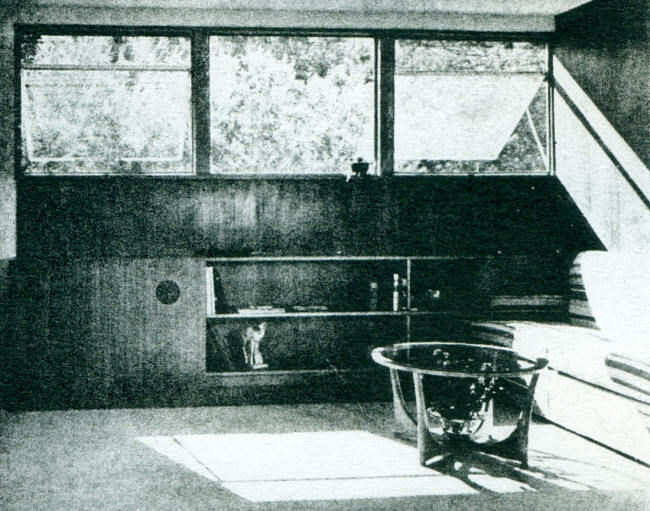 By this point Soriano's design principles were well-established: cost-efficient construction either in wood or concrete, a practical plan with maximum space efficiency, a functional household organization for minimum work, built-in furniture, response to climate, and a strong inside-outside relationship that expanded living spaces to the exterior. 1936 - The Emanuel M. and Helen Lipetz House, 1843-9 North Dillon Street, Los Angeles CA. Overlooks Silver Lake. It created a sensation in Paris where it won the prestigous Prix de Rome in 1937. The main feature is a semicircular music room for Helen Lipetz's grand piano and up to 20 guests. Shelves, seating areas, and much of the other household furniture was built in. The music room with continuous windows comprised nearly one-third of a total 2300 square feet. Sold in 2007 to to William (Bill) Macomber and Anne (Annie) Weisman. They removed the 1950's alterations and worked with architects Fung and Blatt on a restoration: builder Granger Faulk; interior design Amy Sklar. 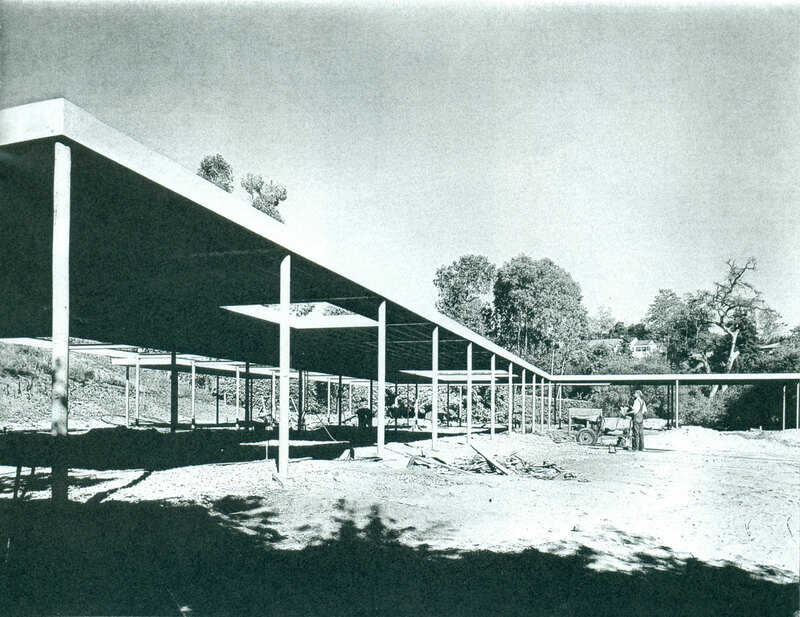 Third photo by Julius Shulman; first, second, fourth by Michael Locke. 1936 - The Harry Hartman House, 861 El Campo Drive, Los Angeles CA. Unbuilt. 1936 - The Harry Blackman Duplex, Los Angeles CA. Unbuilt. 1,000 square foot apartment with a separate 500 square foot upstairs unit over the back of the building, reached by a detached exterior stair. 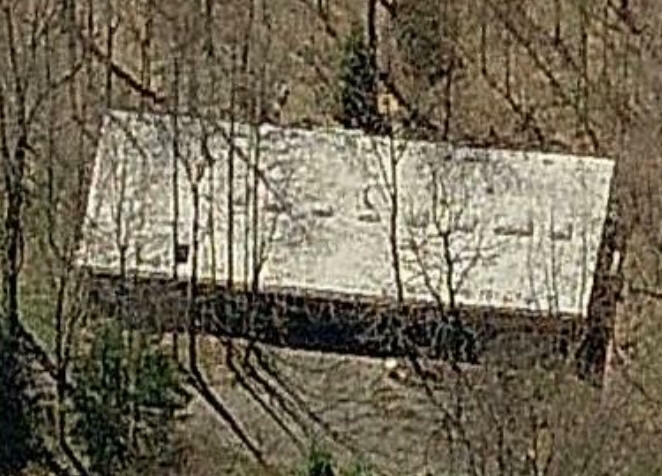 A four-car garage was to be located in the back. 1937 - The Dodie Priver House I, 1830 North Dillon Street, Los Angeles CA. Commissioned 1936. Designed for a young working couple, this 500 sf studio house was built of redwood siding on the highest point of a very steep lot. The low cost ($2,000) yielded maximum space and functional efficiency. 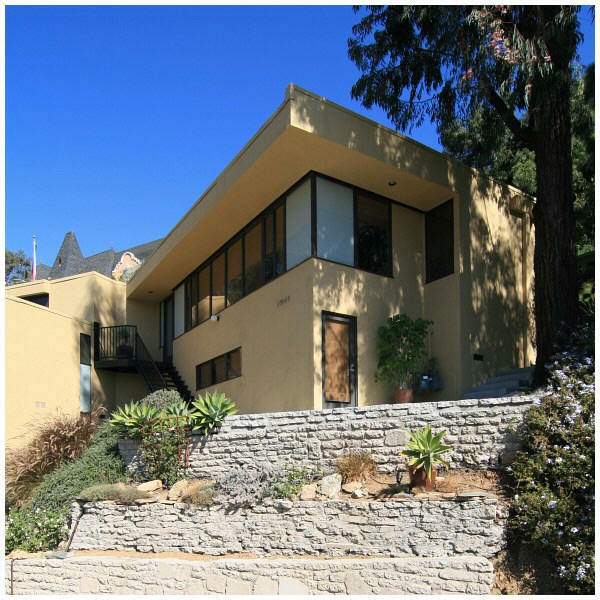 In the 1940's it was demolished and architect Sumner Spaulding designed a 4,000 sf estate for executive Edwin Loeb, with 1948 alterations by Richard Neutra. 1937 - The Leonard DeLorenzo Remodel, 1501 Summitridge Drive, Lot 15, Tract 7996, Beverly Hills CA. One closet and bed in master bedrom and one bed in the studio of an existing home. Sold to Guillermo and Maria Torre; Joseph and Marjorie Walsh. Sold in 2015 to Richard Mandel. 1938 - The William Ross House, 2123 Valentine Street, Los Angeles CA. A game room and utility room on the lower level were cut into the slope and the living room and kitchen faced the sreet with a continuous band of 3' x 5' steel sash windows. 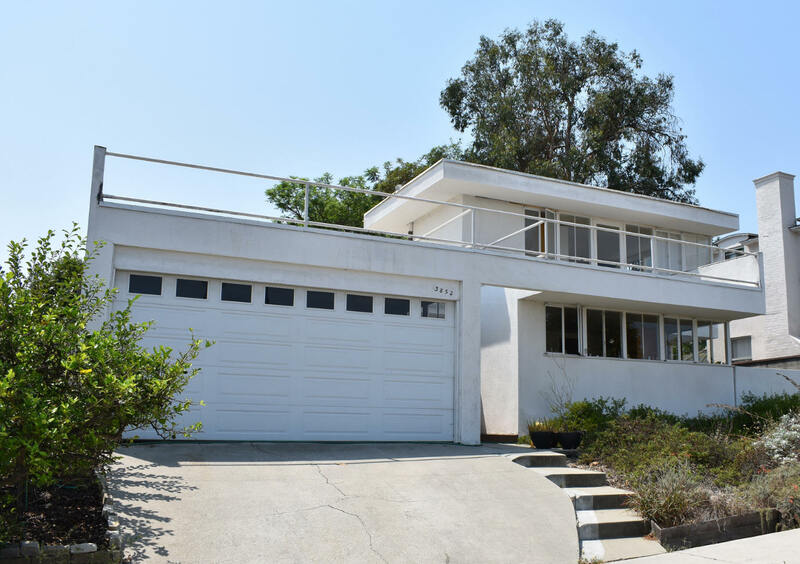 Sold in 1947 to Albert Nazaki, a former USC classmate of Soriano's, who died in the 1980's. His wife lived there until the house sold in 2007 to Gareth A. and Christine Marie Kanter. 1938 - The Spencer Austrian House, 3056 Landa Street, Los Angeles CA. Two stories, with the first floor housing a two-car garage and a rental studio apartment with its own entrance. The walls of the studio were covered with African mahogany and oak flex wood. 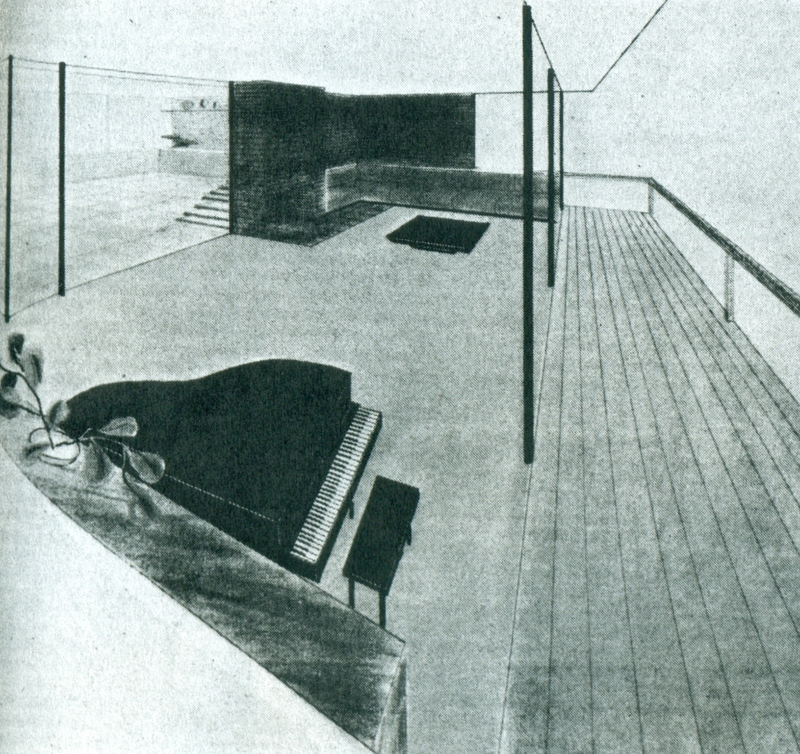 Featured in Architectural Forum, October 1939. Sold to Yael Aflalo. Sold in 2015 to Thomas Olsen. 1938 - The Antonio J. Polito House, 1650 Queens Road, Los Angeles CA. Two-story house on top of a two-car garage. 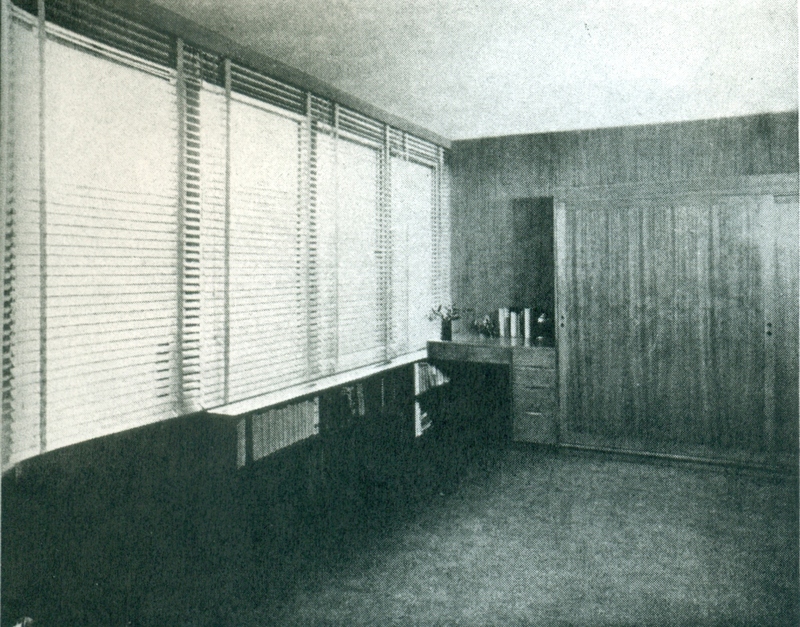 Featured in Architectural Record, February 1946. 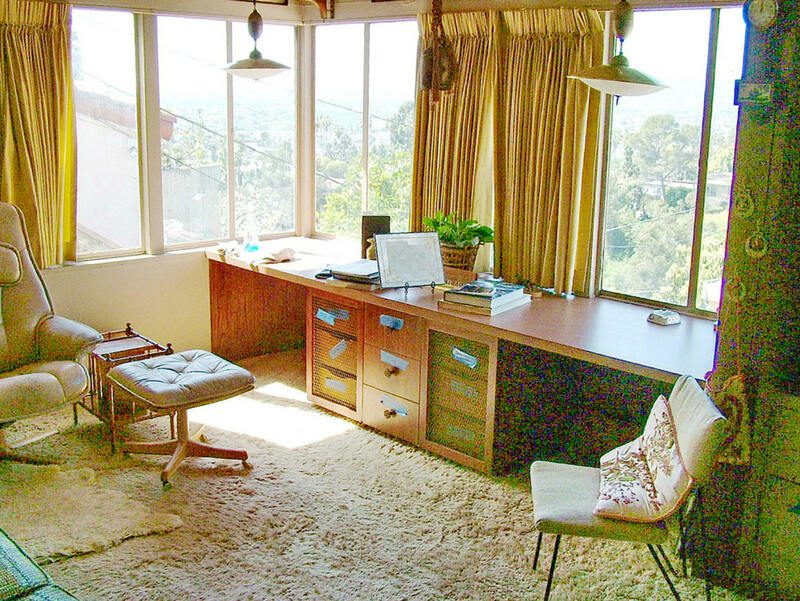 All rooms other than the kitchen and bath faced south and an immense band of windows took advantage of the views of the Hollywood Hills and downtown Los Angeles. A key feature was a 10' x 20' sandblasted window that allowed light to reach the interior stairwell while providing privacy. Minor alterations in 1945. Sold in 2004 to Steven Hamilton. Sold in 2013 to Jared Stein. 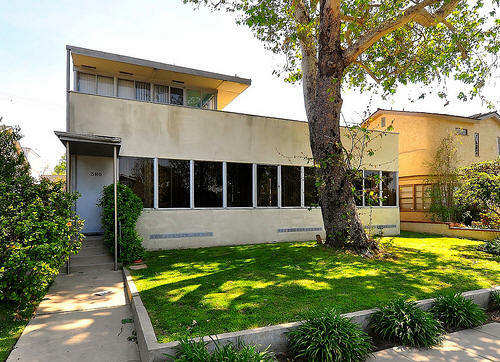 1939 - The Louis G. Gogol House, 2190 Talmadge Street, Los Angeles CA. The owner requested that all rooms save the library be on one floor. Roof decks provided the only outdoor living space since the house covered most of the lot. 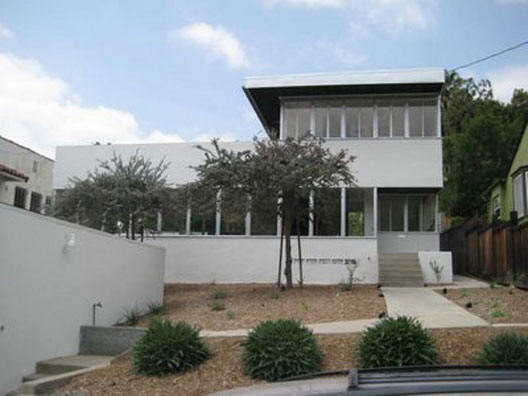 On the main floor three bedrooms on the east side and a combined living/dining area with a southern facade made entirely of glass enclosed a roof deck. A library was situated on top of the first floor and a 2,000 square foot deck on top of that. Most of the furniture was built-in. Has minor alterations. Sold to Richard M. London. Sold in 2003 to Peter Stumpf. Sold in 2011 to Douglas Levine. 1939 - The Newton Stevenson House, 2339 Baxter Street, Los Angeles CA. Unbuilt. Wood house on concrete footings. 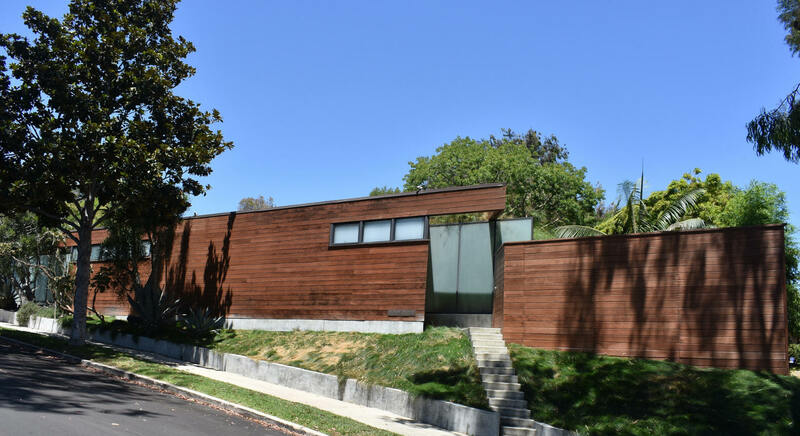 The three-bedroom house was to have steel casement windows between 4" x 4" posts and the exterior was to be clad in redwood. 1939 - The J. A. Meyers House, 1607 Angelus Avenue, Los Angeles CA. Two bedrooms, small bath, and roof deck on the second floor, a large living room that opened up to a terrace on the first. A small dining alcove and kitchen sat opposite, next to a utility room and integrated street facing garage. Sold in 1997 to Raquel Elfassi. Second photo by Michael Locke. 1940 - The Dean and Marion Kimpson House, aka the Kempson-Nixon House, 380 Orlena Avenue, Long Beach CA. Soriano drew this during his six-month stay in the hospital after being hit by a car. Designed for a flat lot near the Pacific Ocean, this small house boasts broad ocean views from the second story and an exquisite view of a lagoon from the first. A spacious terrace, protected by a windbreak of sandblasted glass, adjoins the living and dining room. Transferred to Gladys M. Nixon. Sold to John Howard Bloomingdale. Sold in 2012 to Alan and Stephanie Pullman. 1940 - The Abram Koosis House, 1941 Glencoe Way, Los Angeles CA. An exterior staircase led to a small balcony, from which the house was entered. 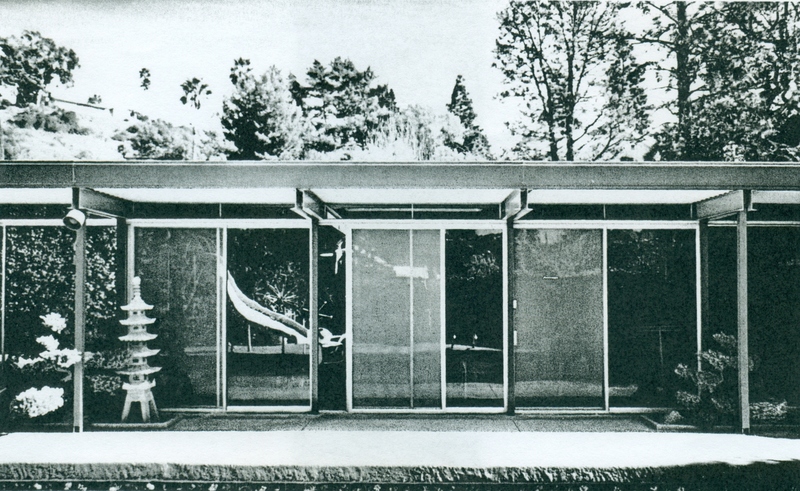 Top photo of the original house by Julius Shulman. A concrete garage was later added and cut into the sloping site at the lower street level (second photo). 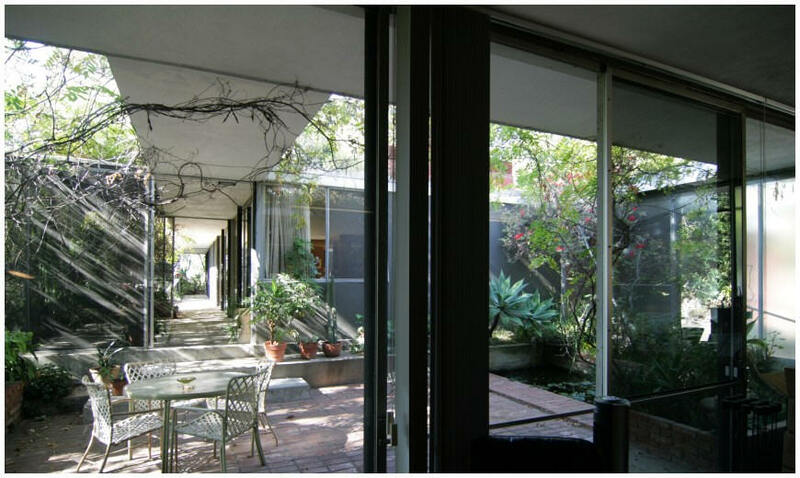 A stylistically similar two-story guest unit was added by architects Gordon Bird and William Rietkerk in the 1960's Soriano's blessing (third photo). Bird and Rietkirk lived in the house for over 40 years and sold it in 2005. According to Rietkirk, their drafting room was below the living room. Sold in 2012 to Shaked Berenson. "Glen changed the course of my life. He was building a house with architect Raphael Soriano, and he had a feeling that I might like to see the process, so he dragged my over there one day. Soriano was there, wearing an all-black outfit with a black beret, giving directions in his accented English (he was from Rhodes), and telling men how to put up steel. I really got into it. The next day Glen called me into his office. He said, "You know I have this hunch. Will you go along with me?" I said, "Whatever you say, boss." He signed me up (and paid for) a night school architecture class. The class was the first time I did something that got people saying, "Hey there's something going on here." They like what I did and I enjoyed it, and the school skipped me into the second year." First photo by Julius Shulman. The house began to deteriorate in 1967 when Glen Lukens died. The house was nearly destroyed in the 1980's (middle photo). Bottom photo by Michael Locke. Sold in 2010 to Michael R. Chapman who commissioned Barry Milofsky of M2A Architects for a restoration. For sale in 2019. 1941 - The D. R. Drury Addition, 3852 Olympiad Drive, Los Angeles CA. Many sites say this is a ground-up Soriano project, however, his archives indicate it was a two-story addition to an existing house. Sold in 2012 to Maria Gonzales and Jeffrey Haber. Top photo by Michael Locke. 1941 - The Richard Strauss House, aka the Waring-Lewis House, aka the Stauss-Lewis House, 10255 Bannockburn Drive, (aka 3131 Queensbury Drive, Los Angeles CA. Commissioned 1940. Soriano designed much of the built-in furniture, including bookshelves runnng under the windows and beds with storage space behind the headboards. The house was expanded over the years. Sold in 1990 to Merrill Shindler. Restored in the 1990's by Michael Berman. Featured in LA Magazine and Elle magazine. Sold in 1997 to architect Daun St. Amand. Photo by Michael Locke. 1941 - The Robert Triest House, 3432 Wonder View Square, Los Angeles CA. Unbuilt. 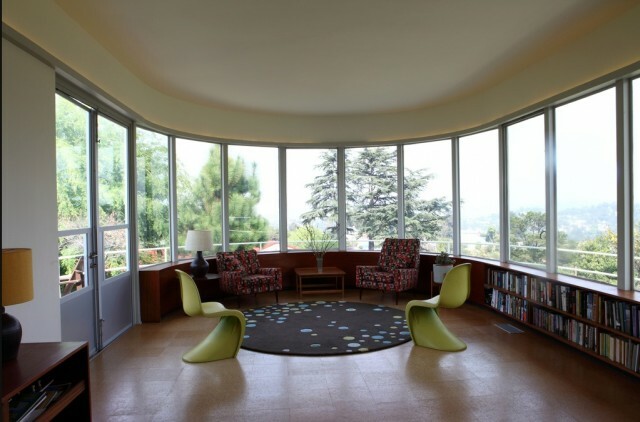 Similar to the Lipetz house with a large, half-circular living room. Another house was built on this site in 1963. 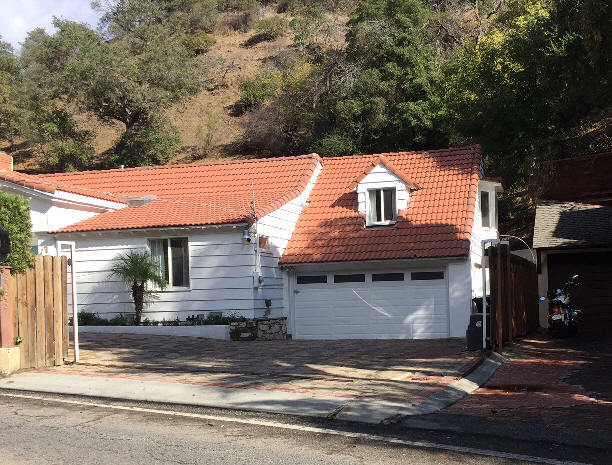 1941 - The W. B. Langsdorf House, 766 Hillcrest Avenue, La Canada Flintridge CA. Unbuilt. Steel sash windows and steel sliding doors were set into 4x4 wooden posts along the building elevations. An English-style estate was later built on this site. 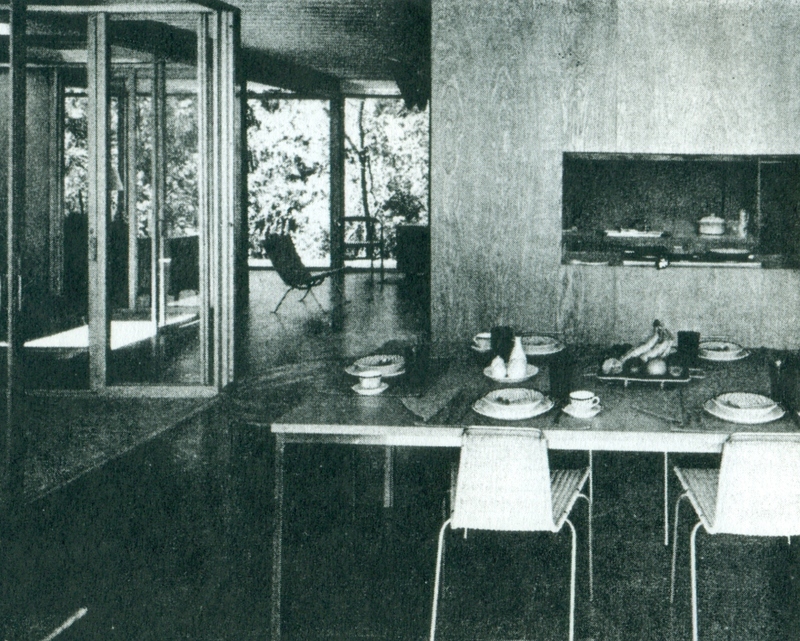 1942 - The Carl Elmer Ebert House #1, 12000 Iredell Street, Studio City CA. Three bedrooms, a studio, a workroom, and a 700 square foot dining/living space. The children's room served as a large play area and could be converted into three bedrooms. Much of the cabinetry and furniture was onsite. The house has since been expanded. Sold in 2001 to Judith T. and Donald S. Broder. Last photo by Michael Locke. 1942 - The 194x House. Unbuilt. 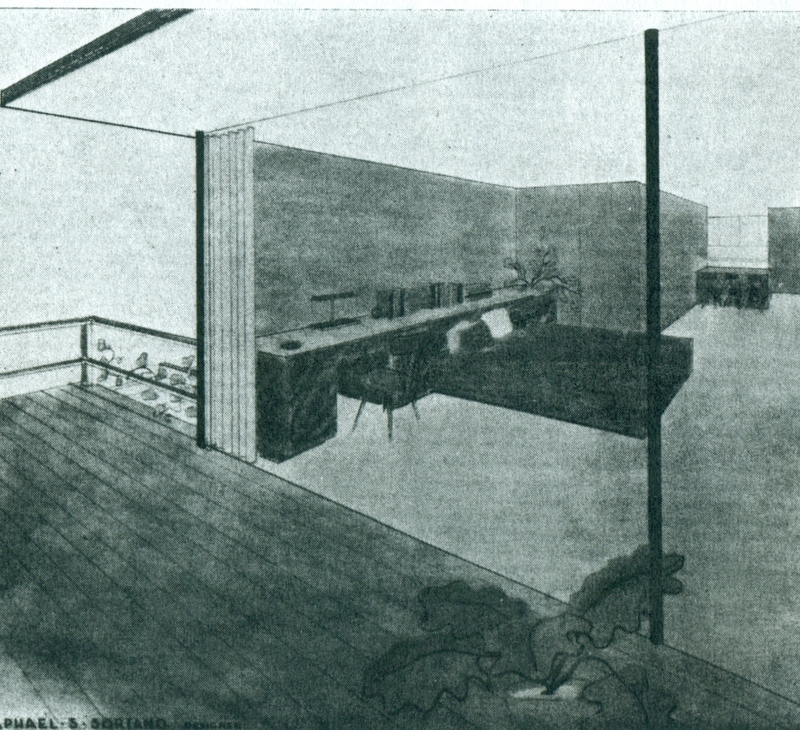 For the September 1942 issue of Architectural Forum, several architects were invited to develop a house of the future, the New House for 194x. WWII had precipitated the development of new, advanced construction methods and materials and had given a tremendous impetus to create mass produced houses. 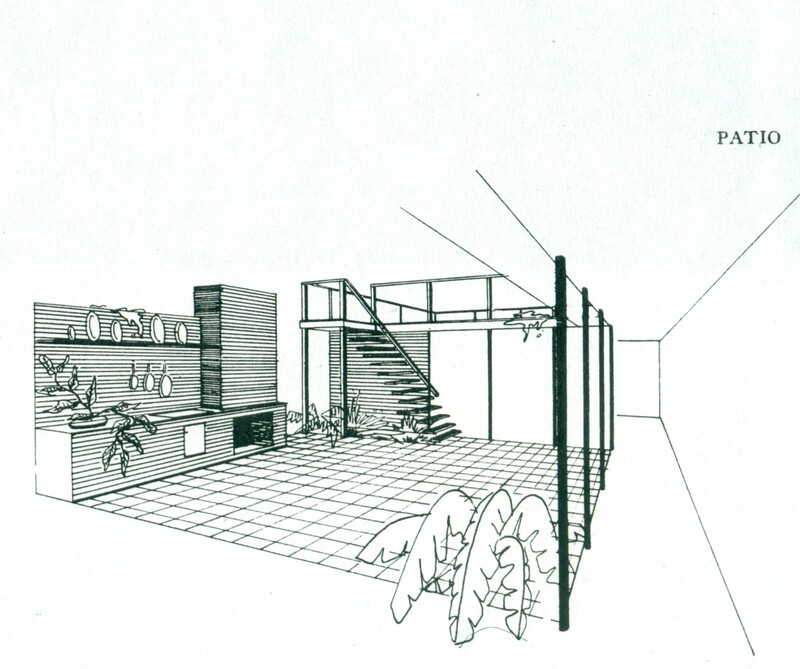 The small house was the common denominator of the competition.Soriano summed up his idea of a Mobile Utility Section in a drawing of an umbrella with a deck chair beneath. This image would be characteristic of his future work. 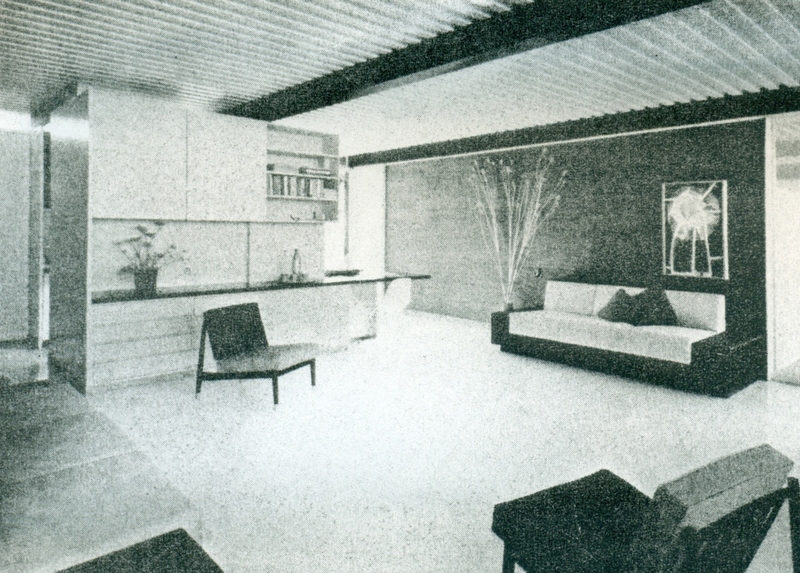 A central mechanical core with kitchen, bath, and utility room supported a wide cantilevered roof that covered a combined living and dining room on one side and bedroom with patio on the other. The structure was of resin-bonded plywood and was based on a 5' module. The roof trusses were designed to fold back so they could be moved easily by truck. It required no foundation but slid onto a 10' x 12' trench that contained plumbing and utility connections. The walls, made of glass or sandwich panels finished in plactic or wood, were placed into floor and ceiling channels and snapped in place; they could be easily removed if necessary. Furniture was completely sectional and based on a 4' module. 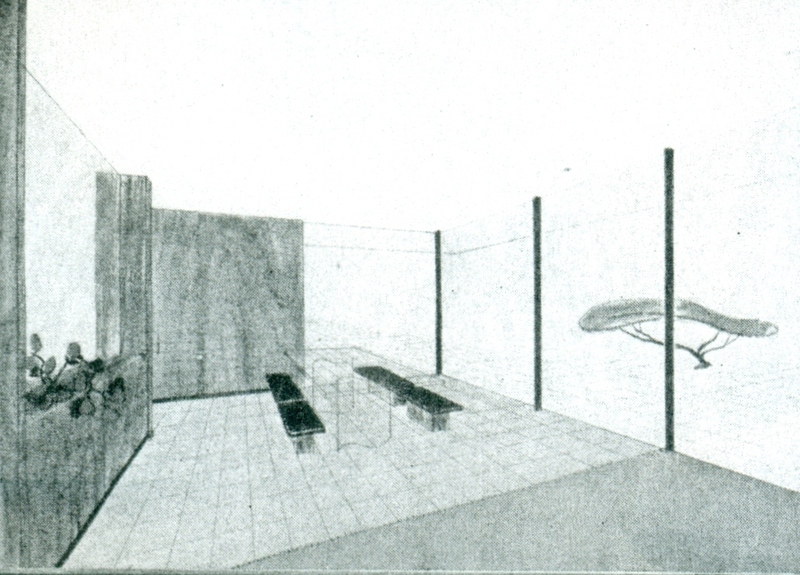 1943 - The Plywood House, aka Arts and Architecture 1943 Postwar Living Competition Entry. Unbuilt. 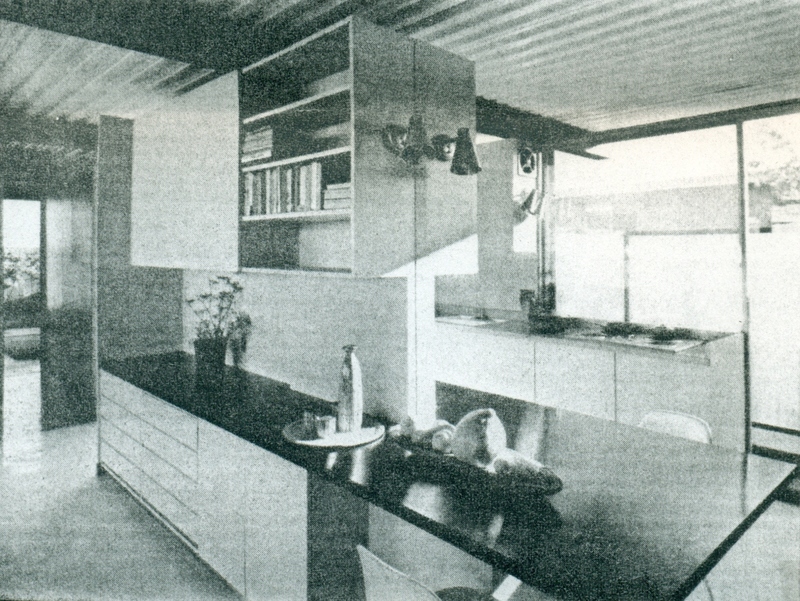 Soriano's second wartime housing prototype won 3rd prize. The sections could be rearranged and added to, enabling a structure to expand from 500 to 1,000 square feet or beyond to fit any any family's needs and budget. Each segment came equipped with prefabricated furniture, wiring, plumbing, light fixtures, heating, and ventilation. 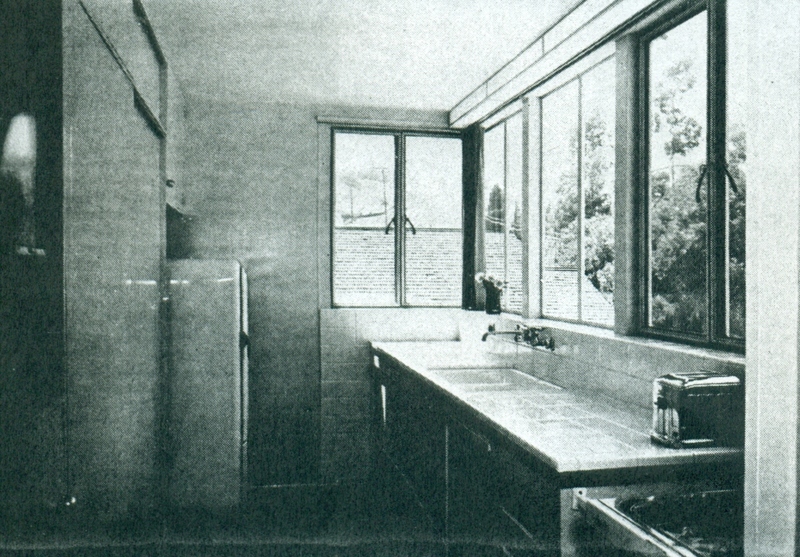 In a variation of Buckminster Fuller's Dymaxion House, the two bathrooms and kitchen were stamped out of stainless steel. Fiberglass laminate or light sheet metal could be substituted for the plywood membrane. 1946 - The Garden Studio Apartments. Unbuilt. This group of apartments was designed for a 100' x 320' site. The ground-floor spine of the comblike complex consisted of fifteen double garages grouped in threes; and above were ten studio apartments in groups of two, each opening to its own private terrace. Passageways led to five two-story units consisting of six apartments, each with a combination living/dining space, kitchen, bedroom, bath, and private garden or balcony. All building blocks faced south and were separated by 26' wide garden strips. The light steel structure was based on the module of the unit apartment. 1946 - The John Laiken Beach House, 22026 Pacific Coast Highway, Malibu CA. Unbuilt. Soriano designed a two-story wood building whose design maximized ocean views with wide expanses of glass and multiple outdoor decks. He took into account the flow patterns of the occupants - for example, providing access that did not reqjuire tracking through the house after swimming. The guest quarters had private access and shared a communal patio with main house. 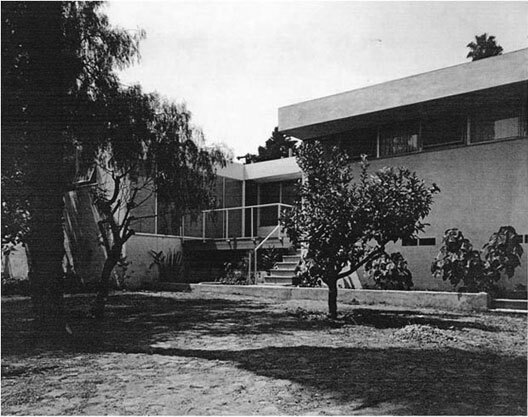 1946 - The Fritz Lang House Remodel and Addition, 1501 Smithridge Drive, Los Angeles CA. Unbuilt. 1946 - The George Tidmarsh House, La Jolla CA. Unbuilt. 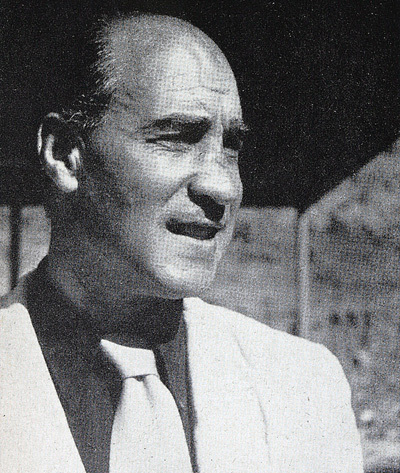 George Tidmarsh, Vice President of Los Angeles-based airplane manufacturer Consolidated Vultee, had worked with Soriano on the 1942 House 194x competition. 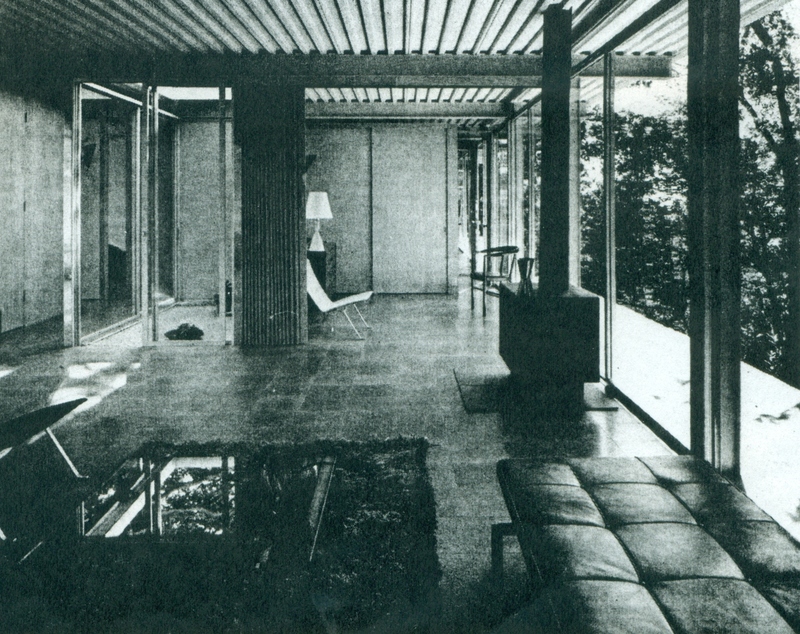 In 1946 he asked Soriano to design his own house. 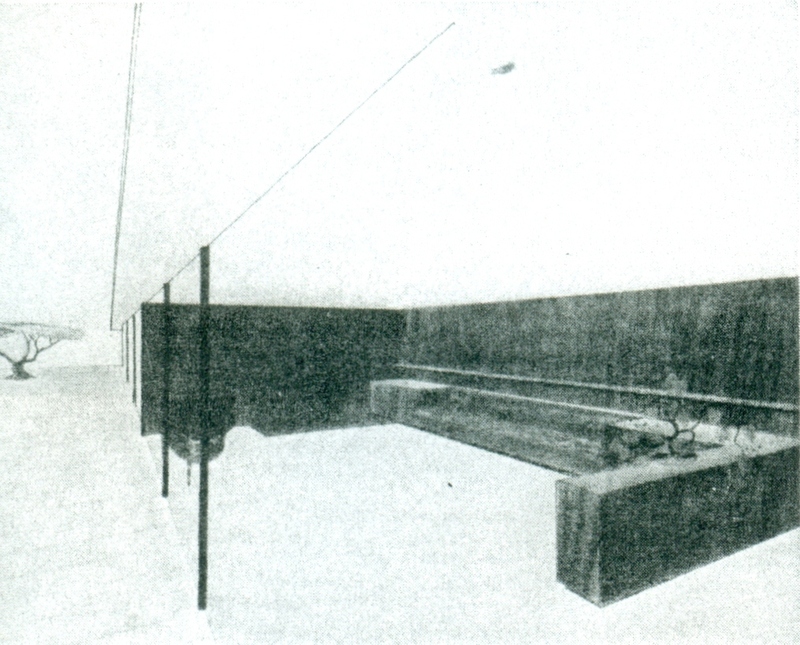 The result was an early example of the use of modular steel construction for a single-family house; it gave Soriano the flexibility of working with non-load-bearing walls. 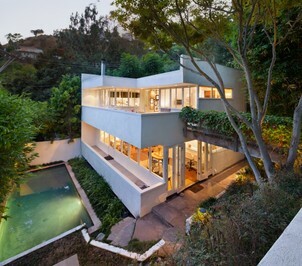 The design is similar to the Katz house, which was realized a year later. 1946 - The A. Leonard Remodel. A remodel of an existing building. Likely unbuilt. 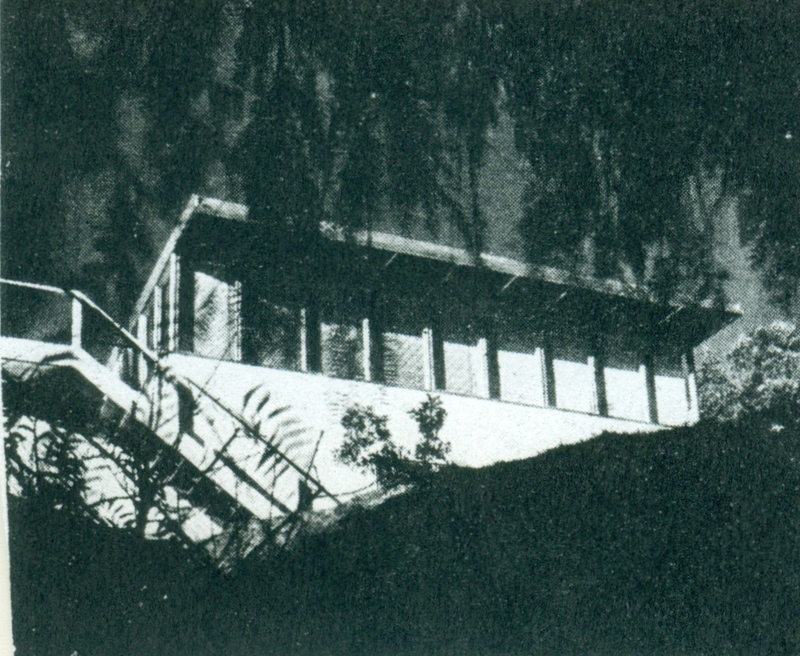 1947 - The Milton Katz House, address unknown, Studio City CA. Commissioned 1942. Soriano derisively renamed the Katz house the "Gato" house (cat in Spanish) after differences arose between him and his clients. The design began in 1942, but completion was delayed five years due to the construction halt during WWII. The design was Soriano's first residential steel structure. A two-car carport is located on the western side of the house. Got a mention from Progressive Architecture in a 1948 competition for small houses. Won an award from the AIA Southern California Chapter. 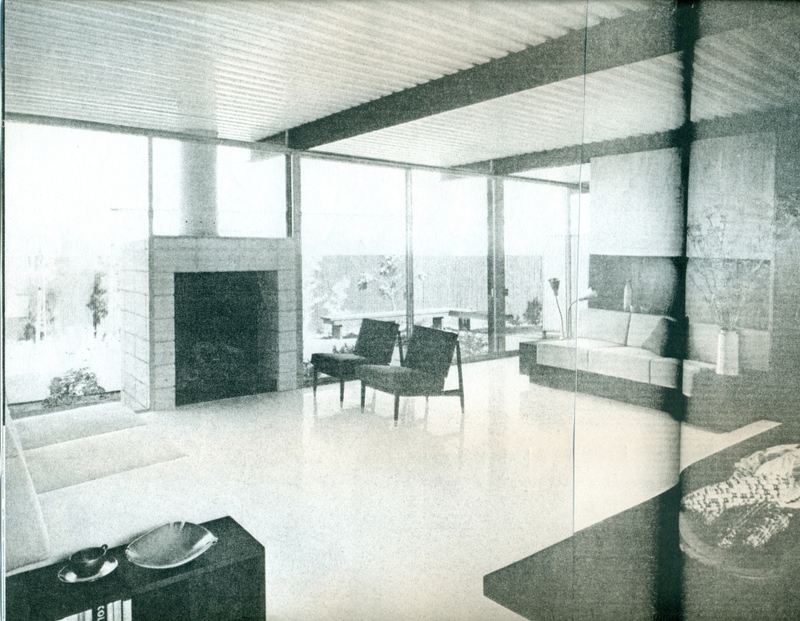 1947 - The M. S. Priver House II, Los Angeles CA. Unbuilt. The irregular L-shape of the house was the result of the site's difficult typography and the owner's requirements. The earth was leveled on a steep 55' x 70' site with a single view to the south. 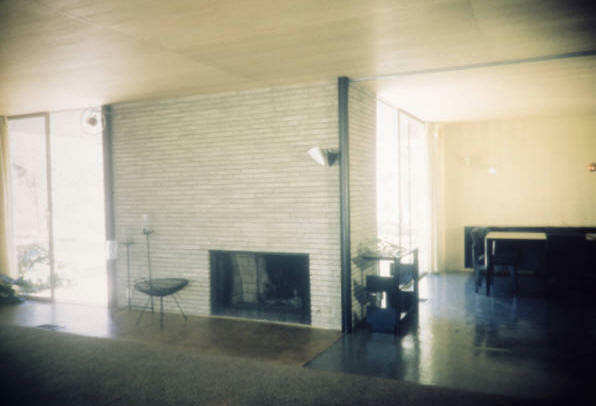 The design was similar to the Katz house: Plywood and glass were used to finish the steel structure on the inside, and the outside was finished with plaster. 3" steel columns and 8" wide-flange steel beams were set apart ten feet on center, utilizing the flexibility of steel-framing to achieve the irregular layout. The dining/living area and the master bedroom opened onto an enclosed outdoor living space occupying the north wing toward the rear were the kitchen and breakfast areas, working room, and maid's room, which included a bath and separate entrance. The carport was placed on the west side next to the entrance to alow a quick departure for the doctor's inevitable emergency calls. 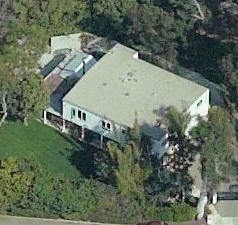 1947 - The Martis Abrams House, 10781 Sunset Boulevard, Los Angeles CA. Commissioned 1946. Unbuilt. Utilized a pipe-column light structural steel frame and Lattissteel infill walls, articulated as a diagonal wall. The program included living room, dining room, library, baths, bedrooms, and a dressing room. 1947 - The Lipps House. Unbuilt. 2,300 square foot, 2-bedroom house using 12' bays. The front and side facades were stucco, while the back facade was fully glazed. 1947 - The Faust House Library Addition. Unbuilt. 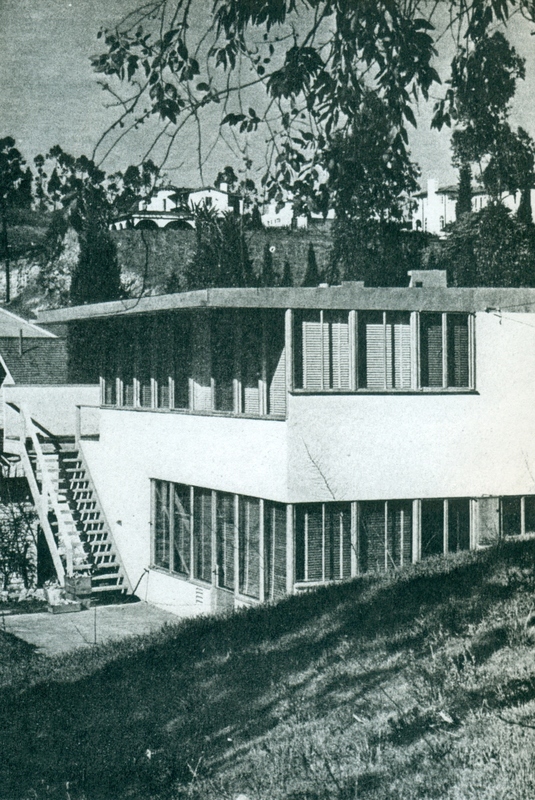 1948 - The Jerome Rosenthal House Addition, 2038 Benedict Canyon Drive, Beverly Hills CA. Sold to T. L. Steinberg. Sold in 1993 to Ellen Brown. Sold in 1993 to Mehrdad Azarmi. Sold in 2005 to Johnathan Kim. 1946 - The Edward Lipson House, 3744 Longridge Drive, Los Angeles CA. Unbuilt. On a long, sloping, suburban lot, Soriano designed the lavish, 5000sf, one-bedroom house for a couple. The project included spacious amenities for guests and entertainment, maid's quarters, generous parking, a large paved terrace, a swimming pool, and changing facilities. 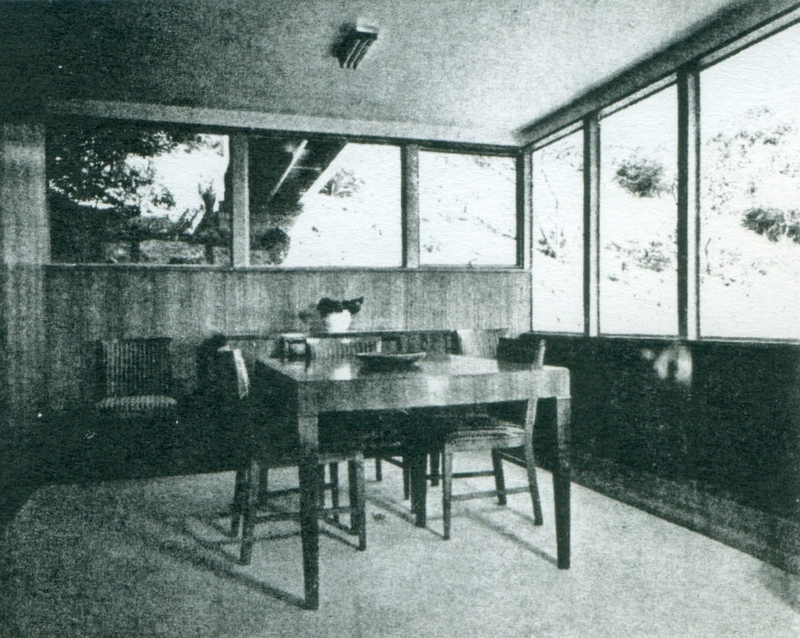 All principal rooms of the single-story house were oriented away from the street and opened through wide glass expanses onto an enclosed outdoor living area. Adjacent to a small entrance courtyard was a long central gallery, lit by a corrugated glass exterior wall, that gave direct access to the living/dining room, the kitchen, and the master bedroom. Soriano's concept again revolved around an 8' x 24' modular system that simplified construction and kept costs to a minimum. The house was framed with light steel joists and 4" pipe columns. Featured in Arts and Architecture Magazine. Another house (not by Soriano) was built on the site in 1948. 1948 - The Charles Moore House, aka Minore House, 275 Epinard Avenue, Playa del Rey CA. Epinard Avenue does not show on current maps, so it may have been renamed. Unbuilt. Similar to the Katz house completed earlier. 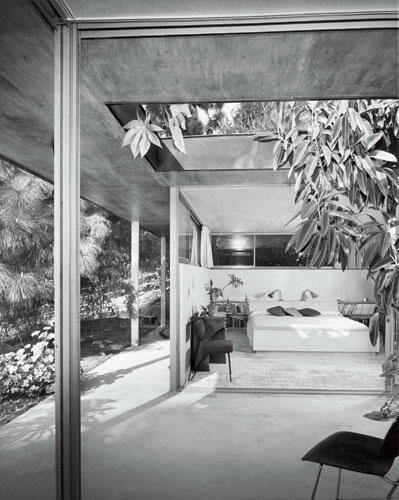 1950 - The Julius Shulman House and Studio, 7875 Woodrow Wilson Drive, Los Angeles CA. Commissioned 1947. Shulman was a famous architectural photographer. 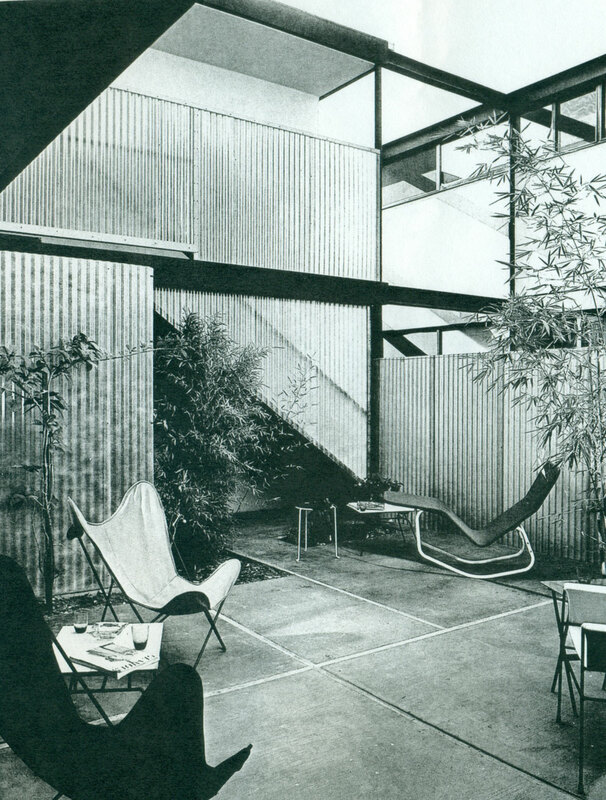 The one-story house with adjacent studio was Soriano's first exposed steel frame house. Garrett Eckbo was the landscape architect. Sold to Jonah Lehrer and Sarah Liebowitz in 2010, a year after Shulman's death. Restored by Lorcan O'Herlihy Architects. 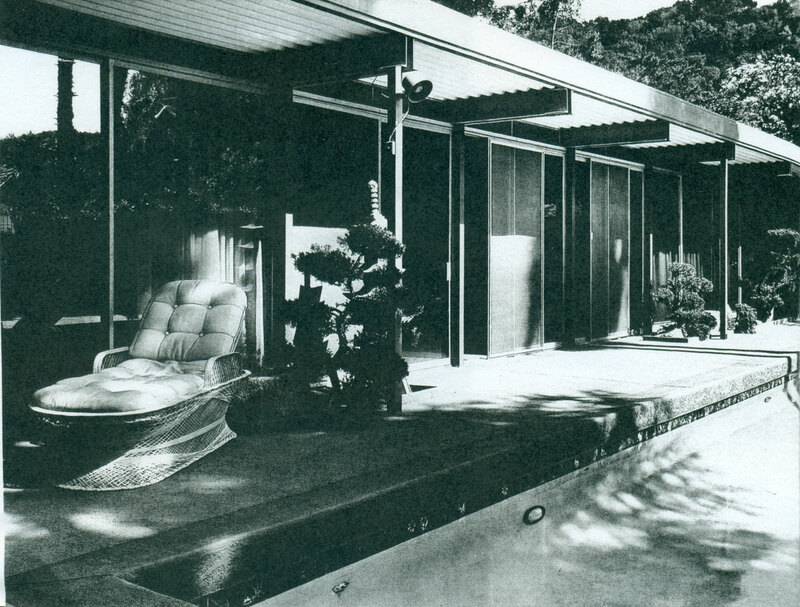 1950 - The Alexandra Curtis House, aka the Experimental House, 111 Stone Canyon Road, Bel Air CA. Commissioned 1949. 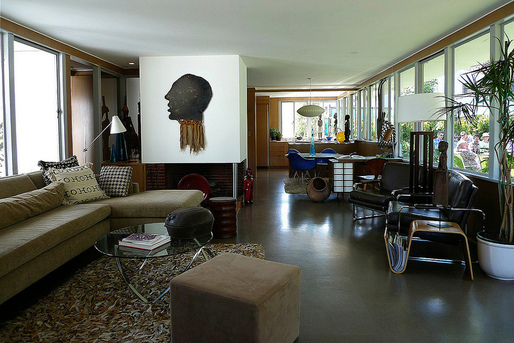 The 4500 square foot, L-shaped house was initially designed for David Noyes. Alexandra Curtis purchased it after construction was completed. The main structure was made entirely of steel and prefabricated cabinets prewired for lighting and telephones were used as interior walls. 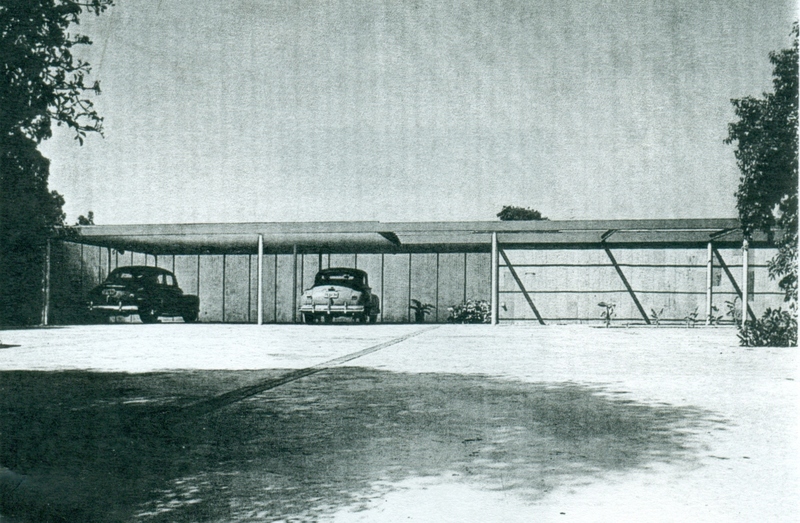 The corrugated steel deck roof was erected in only eighteen hours; it created one large, flexible interior space. Expanded and altered extensively during the 1980s. Sold in 1986 to Alvin and Adelaide Toffler. 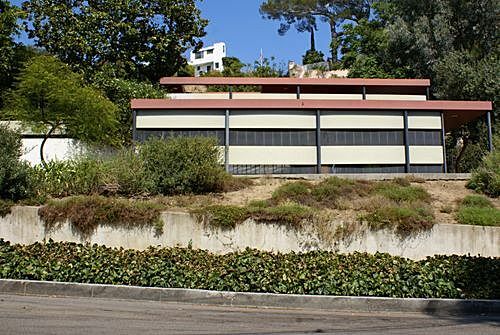 1950 - The Alan M. Olds House, aka the Case Study House for 1950, 1080 Ravoli Drive, Pacific Palisades CA. Commissioned 1949. This house marked a shift in the Case Study Program toward steel frame residential construction. As in the Curtis house, the structure was a modular steel frame based on a 10' x 20' planning grid, supporting a corrugated steel deck roof. The house still stands, but a second floor and a stucco facade, believed to have been added in the mid-1970s, have rendered it unrecognizable. Sold in 1994 to the Gordon family. 1950 - The Fred and Esther McNabb house, Prospect and Cobb Avenue, Sausalito CA. Unbuilt. 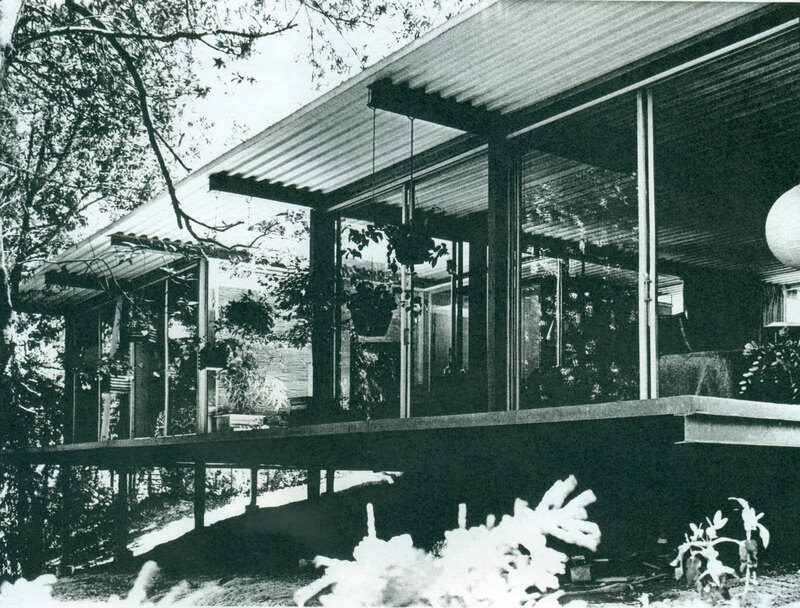 This design was Soriano's first modular steel house in Northern California. 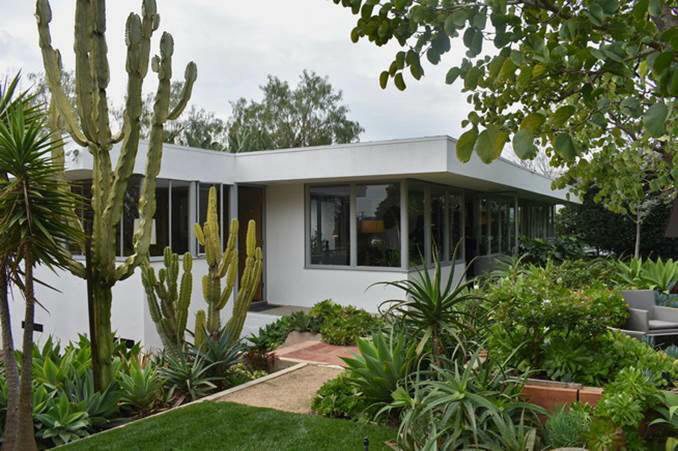 The 3,200 square foot house had a structure based on the 10' x 20' Case Study House module. About 1950 - The Dr. Sheftel House, location unknown. 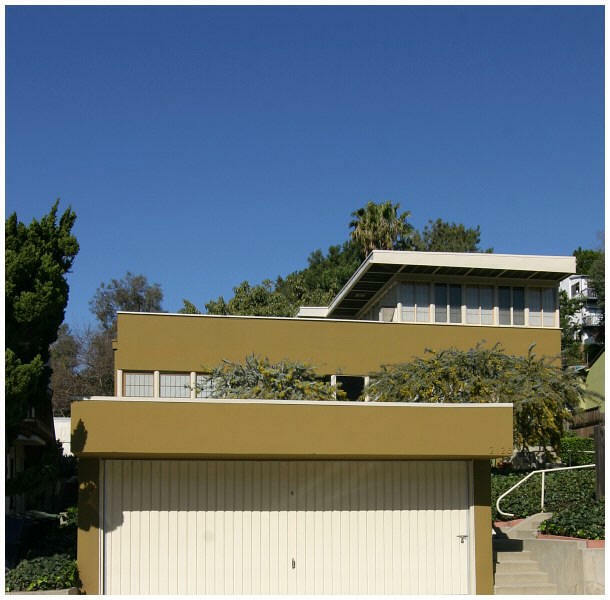 This was another variation on the 1950 Case Study House theme. Only a sketch design in the Soriano archives survives. Unbuilt. 1951 - The Ed Krause House, 8513 La Sierra Avenue, Whittier CA. Commissioned 1949. 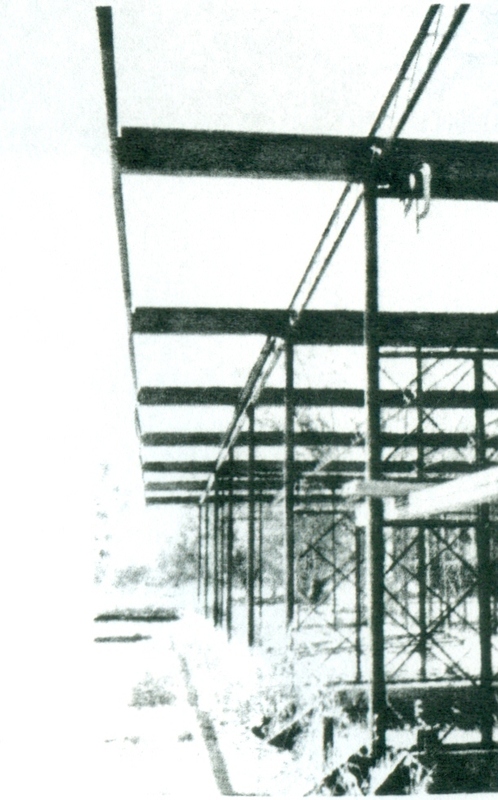 The single-story pavilion had a 43' spanning post and tapered beam steel structure based on a 10' interval. The exterior walls were recessed 3' from the exterior columns and infilled with glass, masonry, and corrugated fiberglass. The front facade facing the carport was closed, with only a narrow band of windows just below the roof line. Sold in 1993 to John G. and Ronda R. Cano. Bottom photo by Michael Locke. 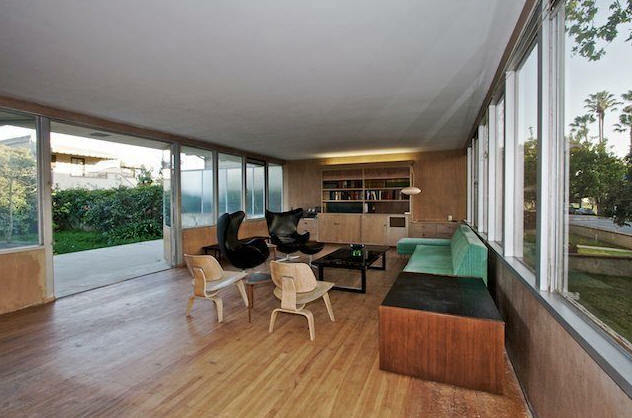 1952 - The David and Rita Schrage / Hellauer House, 2620 North Commonwealth Avenue, Los Feliz area of Los Angeles CA. Commissioned 1950. One of the few Soriano 1950s steel structures still close to its original state. Steve and Marion Dodge bought the house in 1987 and restored it with Soriano's advice. There's a huge train set in the back yard. 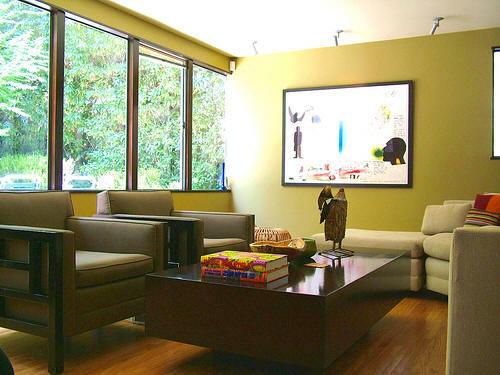 In early 2011, the Dodges pledged the house to Cal Poly Pomona College of Environmental Design. Their $3M bequest includes funding for the future maintenance of the house. Bottom photo by Michael Locke. 1951 - The David Middleton House, Berkeley CA. Commissioned 1950. Unbuilt. 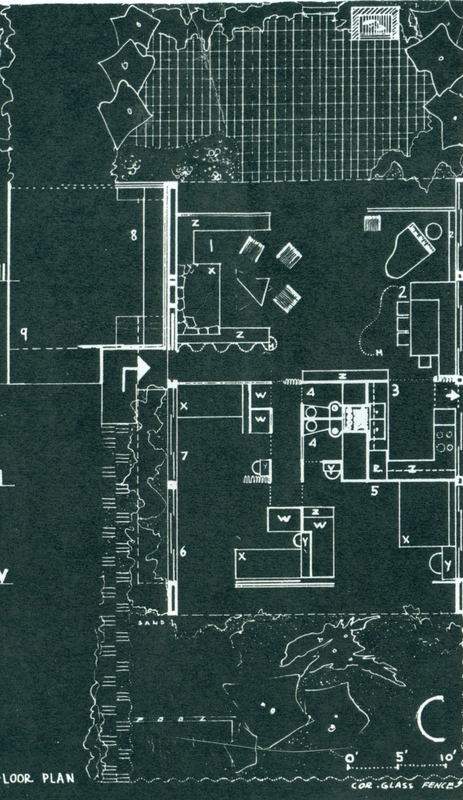 20' x 40' building footprint, this unrealized design was the smallest variation on the Case Study House. 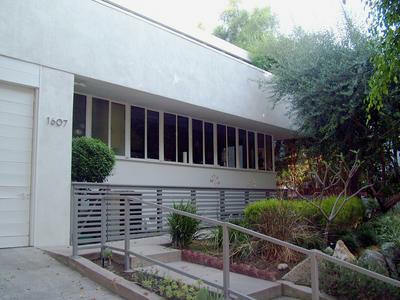 1952 - The Lucile Colby Apartments, 1312 Beverly Green Drive, Los Angeles CA. Commissioned 1950. Colby commissioned Soriano to build a ten-unit apartment building with a penthouse for herself. 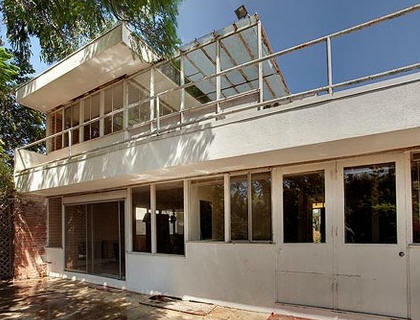 While the design began at the same time as the Case Study House, delays in construction held up completion until 1952. 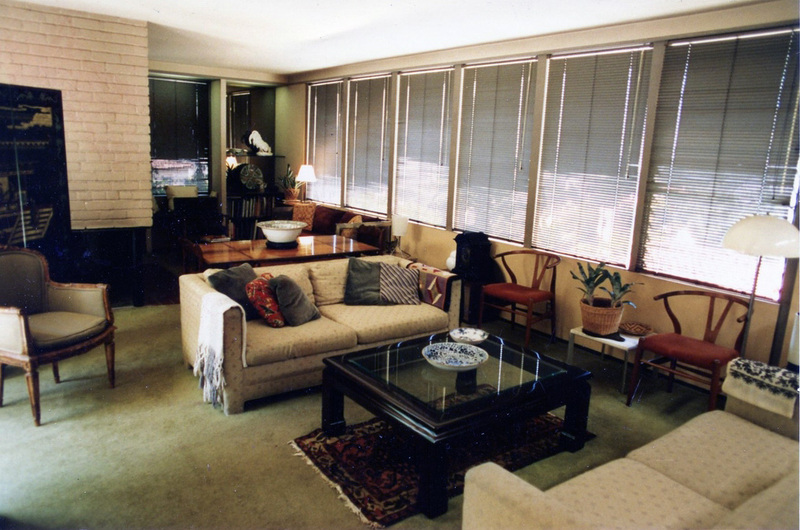 Each apartment functioned as a self-contained unit, with a private entrance and garden. The owner's penthouse occupied the entire upper floor of the northern part; its main rooms opened to a roof deck. Soriano received a national AIA award for this building. Although it was a commercial success and housed many members of the entertainment community over the years, the building was demolished in 1988. A higher density, traditional stucco apartment building now stands on the site. 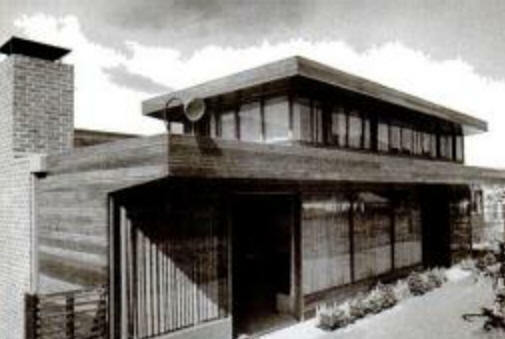 1953 - The Soriano House, Tiburon CA. 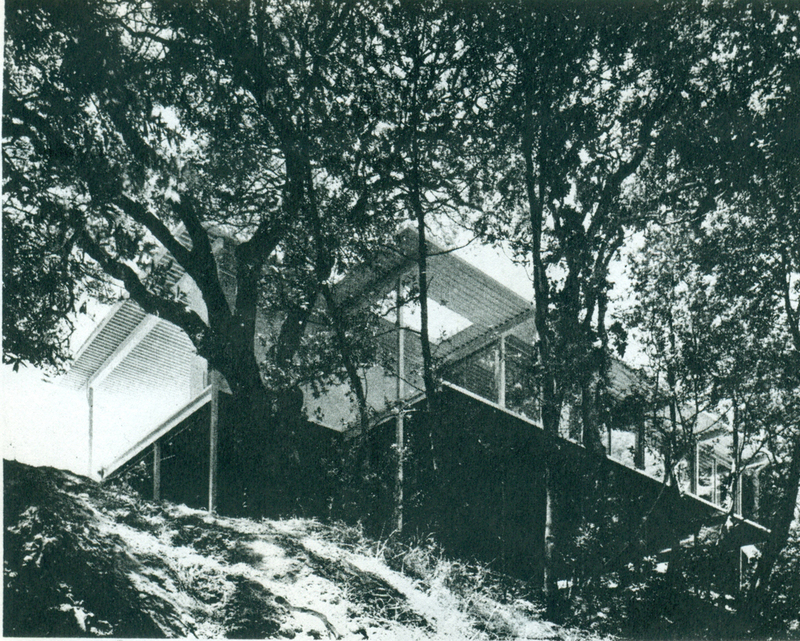 Soriano designed this house and studio for himself and his wife, Elizabeth, on a hilly site overlooking the San Francisco Bay, with views of Angel's Island. 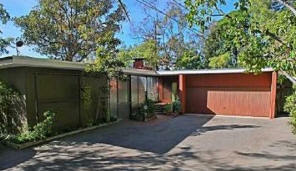 Their move to Tiburon represented a new start personally as well as architecturally. Taking the modular floor plan organization and steel structure Soriano had developed for the Case Study House as a starting point, this project was the next step for his steel frame. 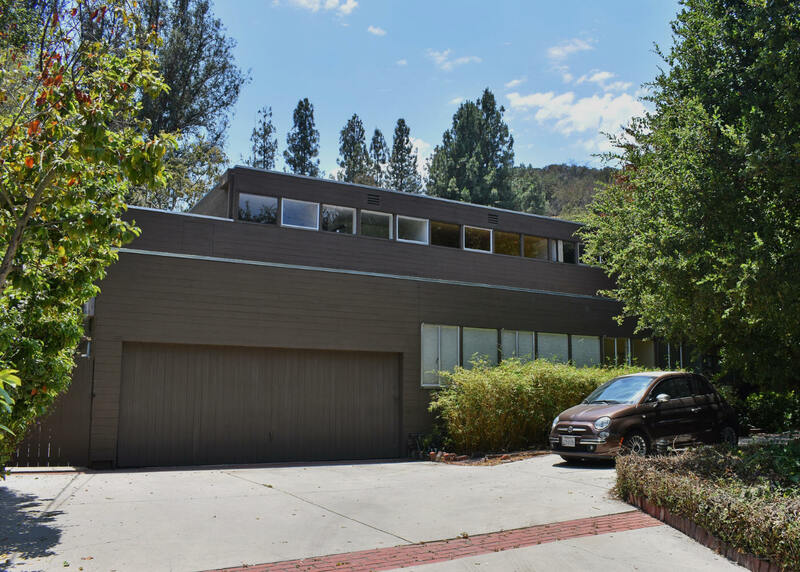 With this house, Soriano moved away from the tubular column and cross-plated column-head steel structure toward wide-flange beam and column-head steel structure toward wide-flange beam and column frames, spaced ten feet apart. 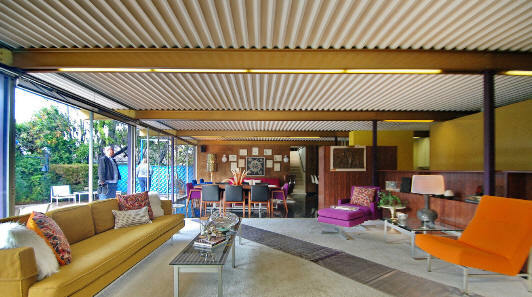 This formed a moment-resistant frame that was decked with corrugated-metal roof panels. The design was developed to the construction document stage, but was never built. 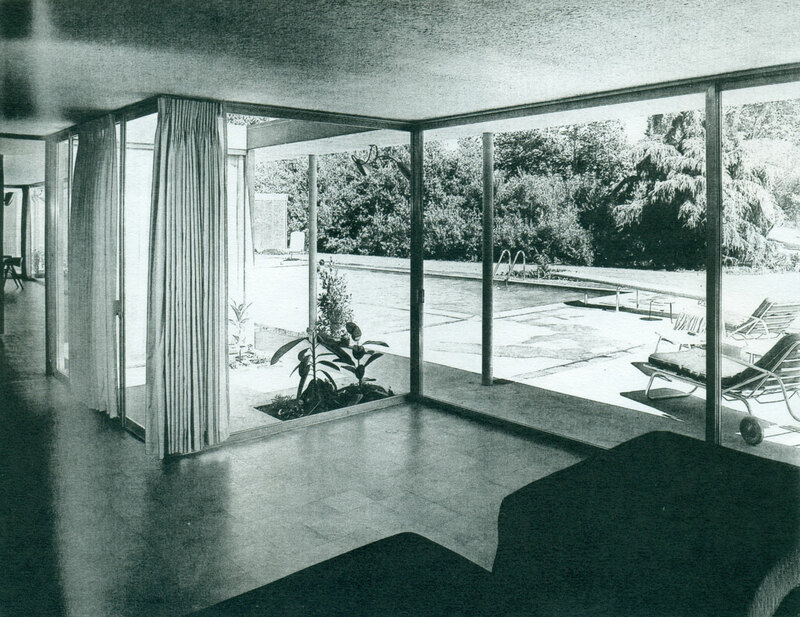 1954 - The Carl Ebert House II, 11716 Laurelwood Drive, Studio City CA. Commissioned 1953. Unbuilt. This second house for Ebert and a second wife was to be a 3-bedroom with doctor's office for himself in the same neighborhood as the first house. The design is a typical Soriano wide-flange steel structure based on a 10' x 30' module, sitting on top of a tow-car garage. The scheme was developed to detail design, but never built. 1954 - The Milton McDonogh Remodel, location unknown. Small kitchen remodel of an existing traditional wood-framed house. 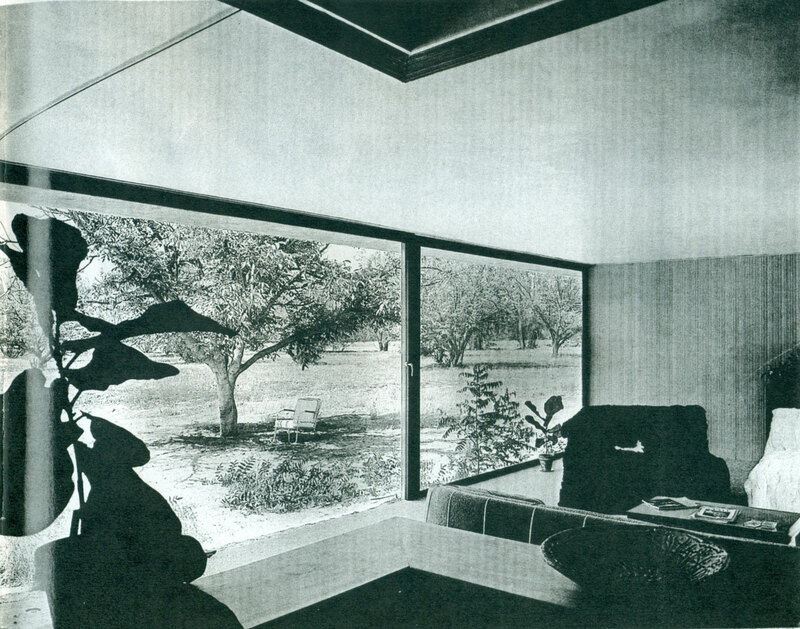 1955 - The Saunders House, Palo Alto CA. Commissioned 1954. 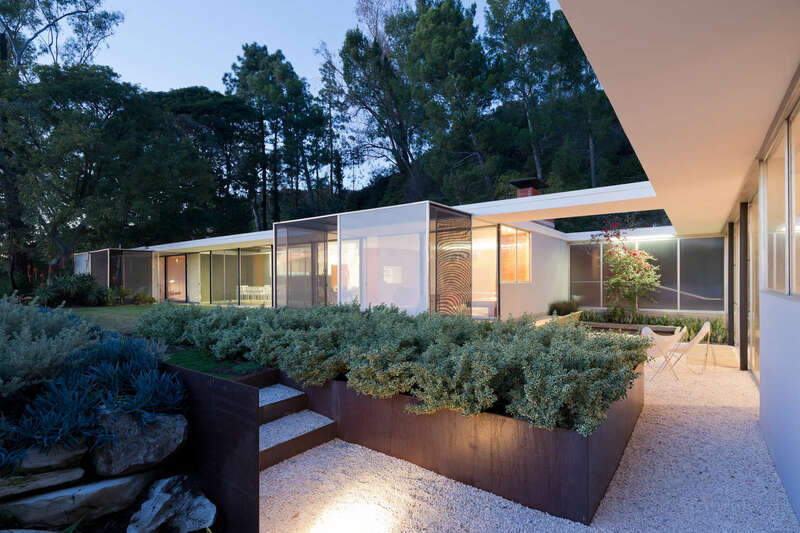 Developer Joseph Eichler commissioned Soriano to design the first completely industrialized, all-steel house, in Palo Alto. Built on a 1,500 square foot rectangular concrete slab and consisted of seven identically welded, light steel rames spaced ten feet apart. 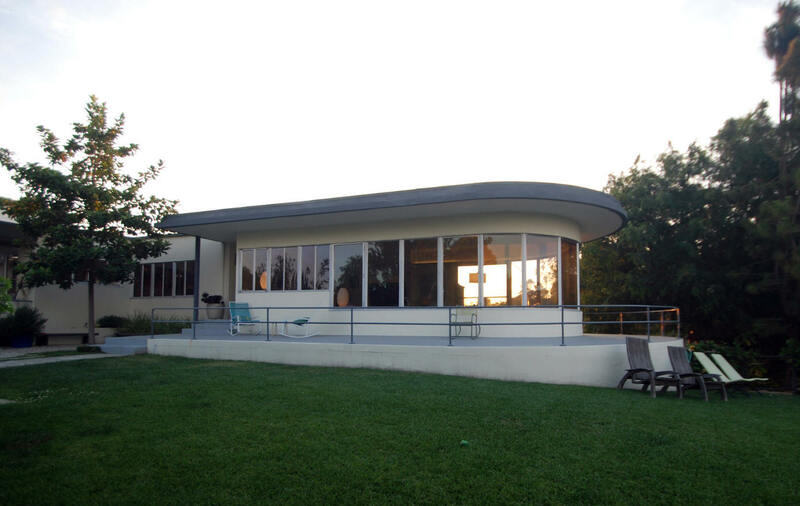 It was topped with a fluted steel deck and enclosed with floor-to-ceiling sliding-glass walls or fixed glass, plywood, or fiberglass panels. All rooms in the compact plan were based on a 10' bay. The first two bays on the wet side were occupied by three bedrooms and two baths, the two in the middle by a combined kitchen/dining/living area, and a double grage completed the rectangle on the east side. 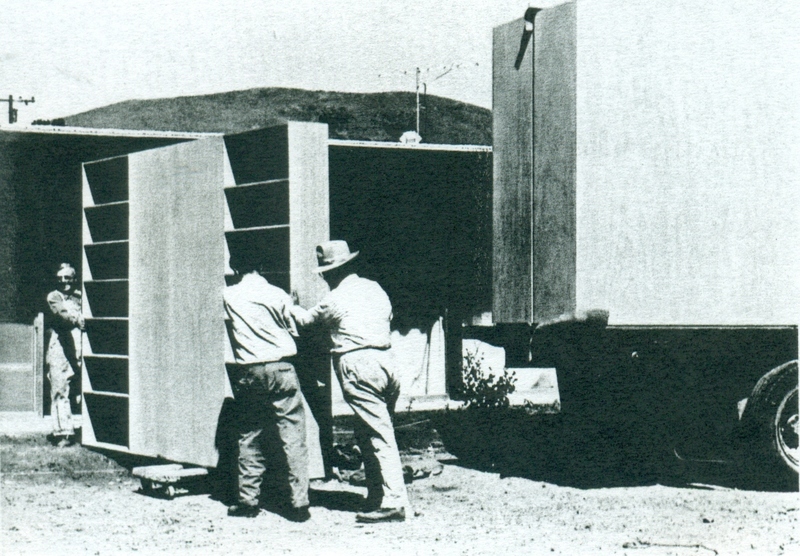 All the interior plywood partitions were prefabricated storage units. 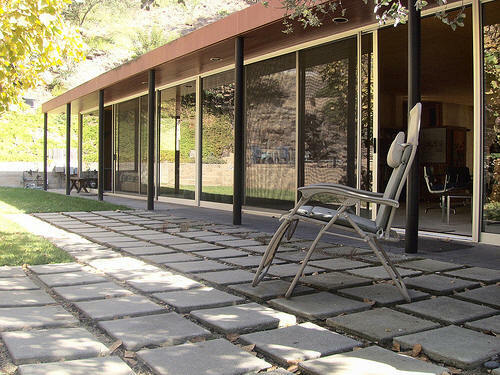 Planned as an experiment to gain production experience for future steel houses, the Eichler House remained a prototype despite promotion and careful attention to detail. The house has been altered beyond recognition; a second story was added along with redwood shingles and stained-glass windows. 1955 - The Peter Bercut House, Lake Tahoe CA. Unbuilt. This design for a 110' x 40' main space had an attached guest suite that created an L-shaped plan. The guest suite had 3 beds and a shared bath and measured 24' x 30'. The main area included a master bedroom, bath, and two additional bedrooms. Two more bathrooms were accessible from a common hall, and a large kitchen was entered from the lving room. The patio adjacent to the living room measured 40' x 20'. 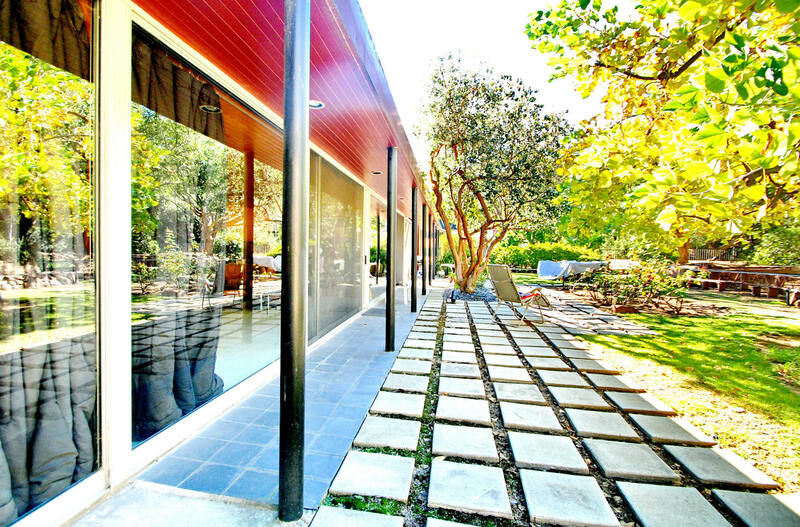 The main frame was constucted of wide-flange steel beams and the exterior walls were galss, like the Eichler House designed the same year. 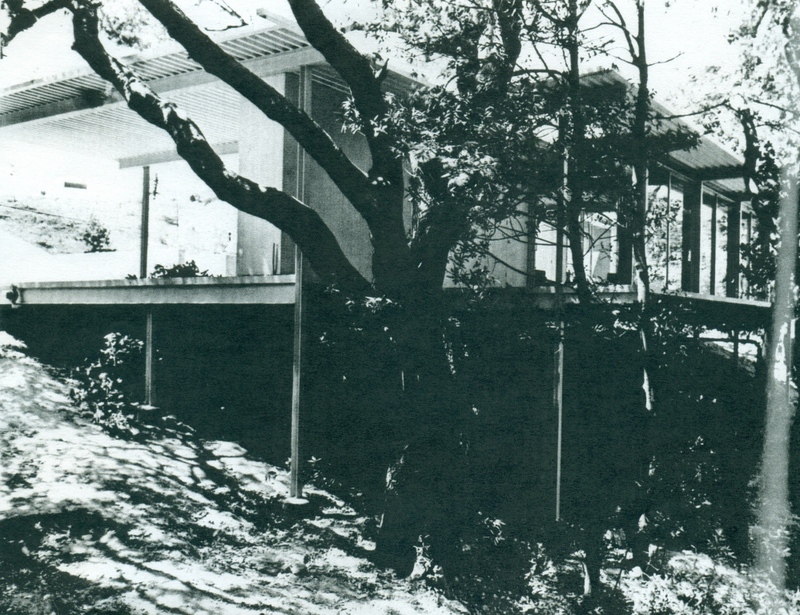 1956 - The Louis Lundberg House, Rock Road, Kentfield CA. Prospects for this residence at two different locations exist. Neither plan was ever built. 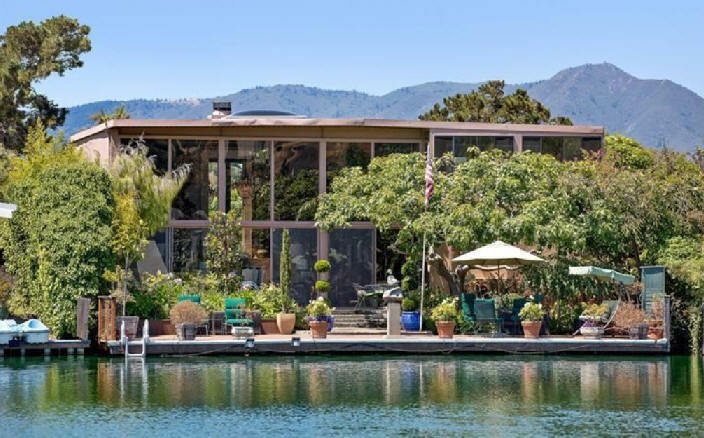 The first location was Kentfield; the Soriano archive contains sketches and drawings showing a panaview window and doorjamb detail, steel roof decking, aluminum structural parts on a concrete slab for this house. The archive also includes furniture details for the living room. Soriano explored a steel structure that spanned up to 40' and a floor plan organized on a circular layout. The second location was in Belvedere CA, though no plans exist for that address. 1956 - The Vera Mahoney House, Strawberry Point, Marin County CA. Commissioned 1955, unbuilt. Mahoney commissioned 3 architects to develop a large piece of land. 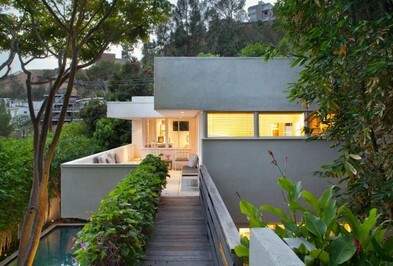 Soriano's role was as the architect for the owner's own house, located on the top of a hill. The semicircular living quarters with encircling balconies faced the San Francisco Bay and were to be set on top of a cylindrical concrete shaft that incorporated a bomb shelter. 1956 - The Eastwood Gardens Estates, aka the Sam Abouaf Development, Napa CA. Unbuilt. Soriano developed three housing types; Types A, B, and C, for a proposed suburban tract in Napa Valley. It was his first attempt at regional planning, his first chance to expand his design thinking from the scale of an individual house to an entire residential community. 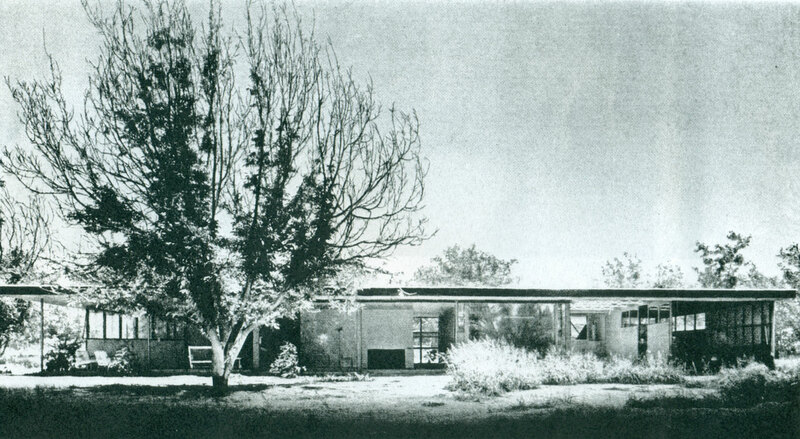 1957 - The Donovan Cooke House, 150 San Rafael Avenue, Belvedere CA. Designed for a doctor and his four children. There was a garage but it was converted into storage. 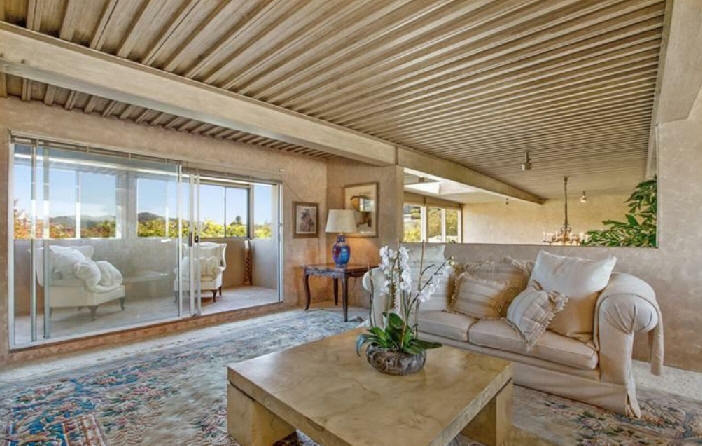 The living room ceiling was raised to 18 ft by architect Sandy Walker. Sold to the Leon and Trudy Cohn Marital Trust. 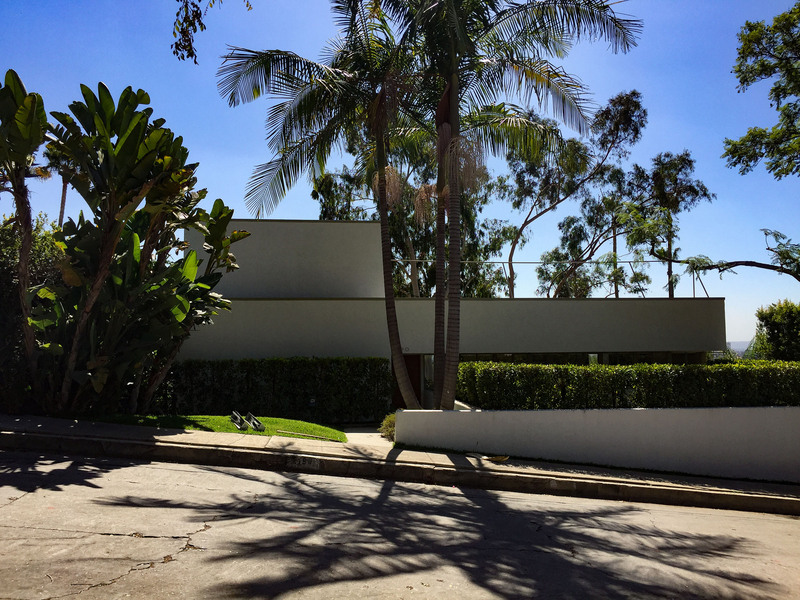 1957 - The Billy Wilder House, Sunset Boulevard and Lomitas Drive, Beverly Hills CA. Unbuilt. 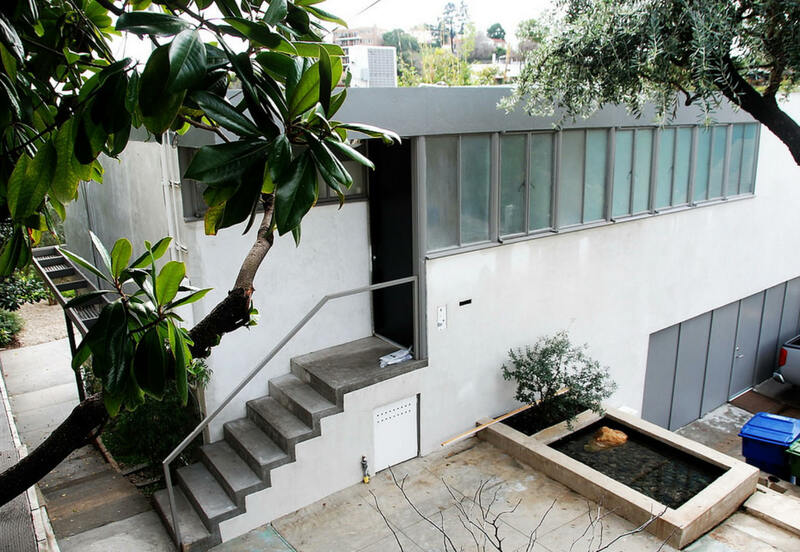 Film director Billy Wilder and Soriano discussed the construction of a 4,000 square foot residence for a triangular parcel of land in Beverly Hills. Wilder expressed regret that the would be hiring another architect because Wilder wanted someone who could be more consistently available than Soriano -- who was living in Northern California at the time. 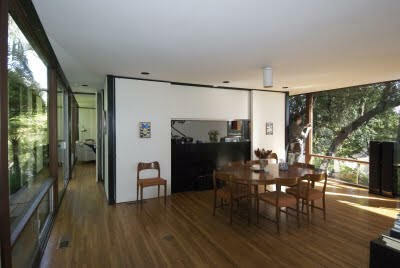 Charles and Ray Eames designed a home for Billy Wilder and his 2nd wife Audrey in 1949, based on the Eames' own home. The design was never built due to the "idotic amount of windows to clean", according to Audrey. 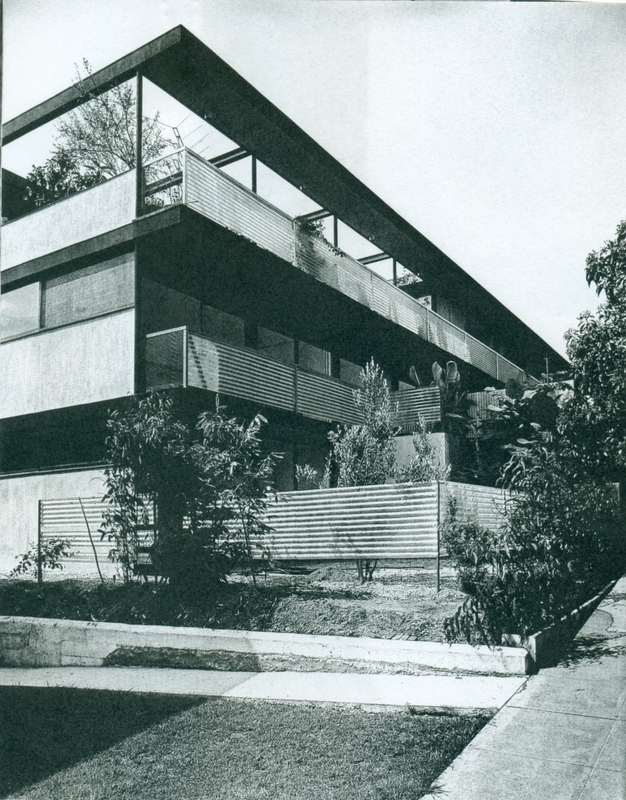 1957 - The Soriano Duplex, Vistazo East Street and Centro East Street, Tiburon CA. 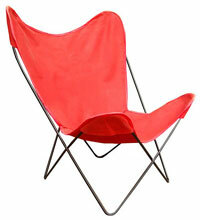 Designed by Soriano for his parents and his own family to share. Unbuilt. 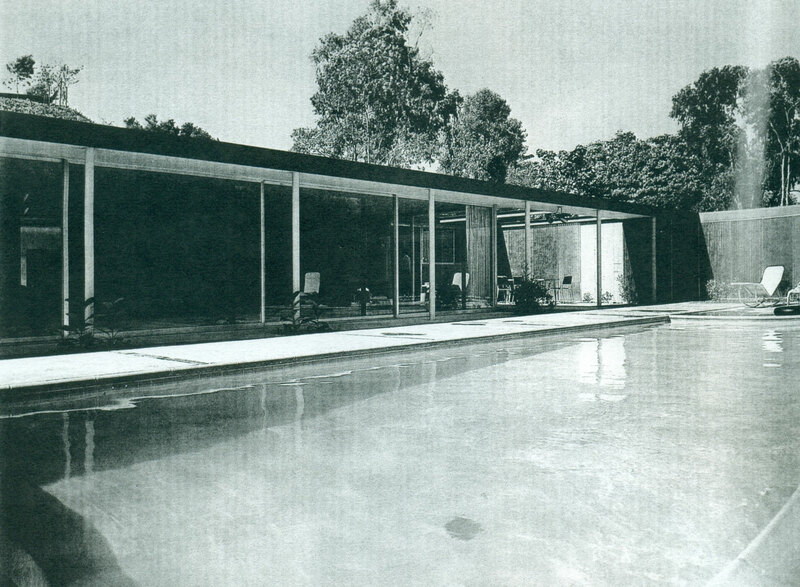 1957 - The Jerry Gilbreath House, Los Angeles CA. Commissioned 1956. 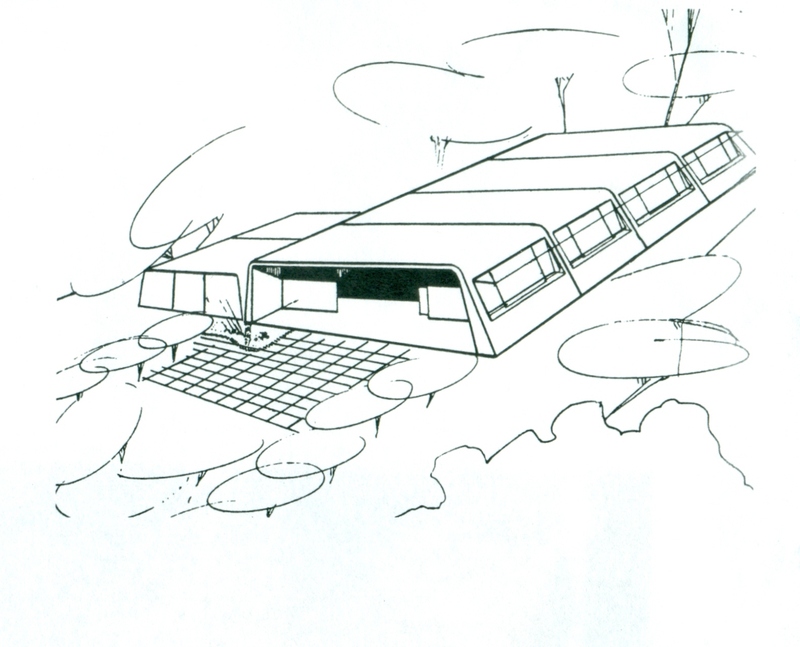 This sketch was similar to that of the Cooke House, using the 40' span, tapered-frame construction. Unbuilt. 1957 - The Lew Lauria House, 7148 Macapa Drive, Hollywood CA. Unbuilt. This design was developed for a large sloping site in Hollywood and used the building system Soriano developed for the Eichler House. He was also commissioned to do the interior design, including built-in furniture. 1958 - The Clarewood Apartments, Kensington Highlands CA. Unbuilt. Sketch ideas for a two-story, steel, one-and-two-bedroom apartment development. 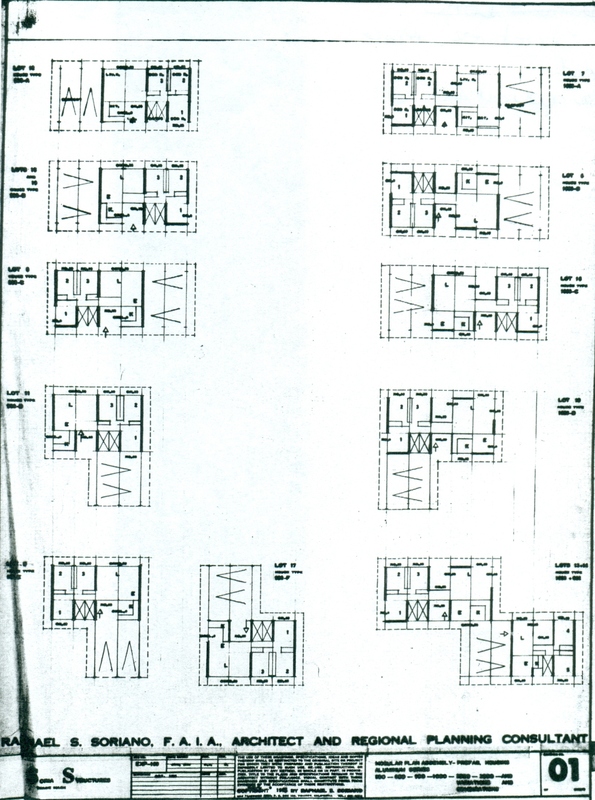 The drawings show a preliminary study for several floorplan arrangements varying from seven to nine units per floor. 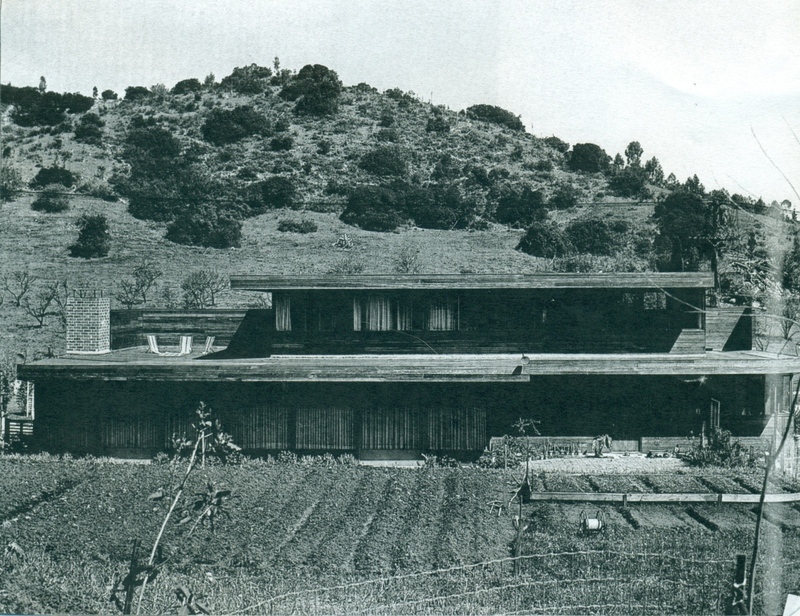 1959 - The Frank McCauley House, 20 Longfellow Road, Mill Valley CA. This compact house for developer Frank McCauley was a pilot showcasing steel construction designed for mass production; this and its neighbor (24 Longfellow) were the last steel houses Soriano built. 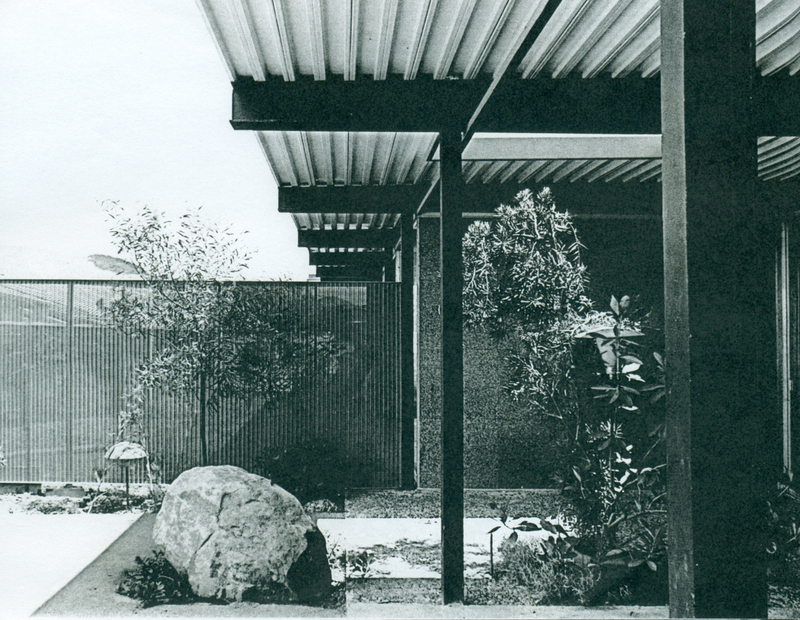 The roof was made from cantilevered, light-gauze metal decking and insulating fiberglass. To obtain maximum interior flexibility, prefabricated cabinets divided the rooms. McCauley intended to develop a series of houses with this building system, but only the neighboring Leaver house was realized. The McCauley house was honored with an AIA Award of Merit and later won two additional prizes. Featured in Arts and Architecture August 1960. Sold to Gideon and Cheryl Sorokin. Sold to Patrick Siu. 1959 - The Leaver House for Frank McCauley, 24 Longfellow Road, Mill Valley CA. Located adjacent to the McCauley House of the same year; identical in structure and material but had a different plan layout. The adjacent two-car garage was connected to the house by a utility and laundry area. Sold to Anton and Jean Victor. Sold in 2004 to Laura Sciaroni. 1959 - The R. L. Hunter House, 6838 Tanglewood Drive, Boardman OH near Youngstown. Commissioned 1957. Built. One of the few variations of the Soriano pavilion located outside California. The design principles are similar to the Cooke House. Sold in the late 1960's to the Tucker family, according to their son Kerry Tucker. Sold to Joseph and Marie Altinger. 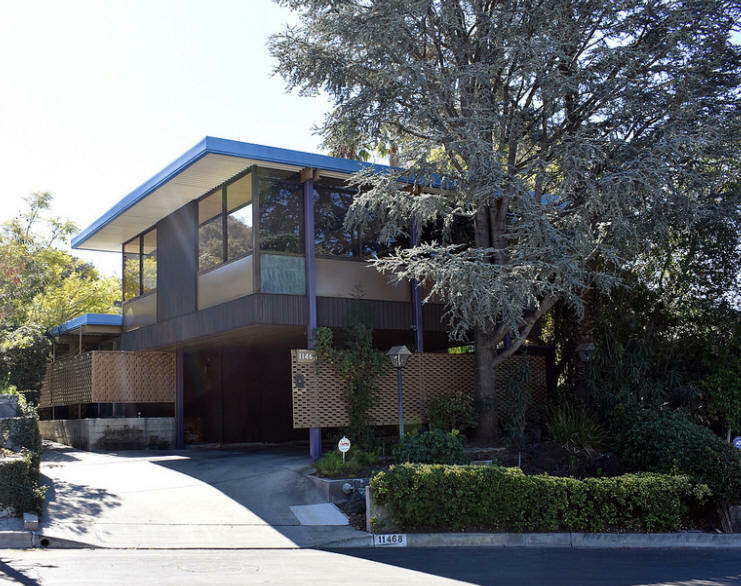 1960 - The George Culler House, Lovell Avenue, Mill Valley CA. Unbuilt. Marked a further modification of the Soriano frame, similar to that implemented in Soriano's own house in 1953. His ongoing refinement of construction details led to a new structural joint connection of two C-channels joined only by a bolt to a 4" square column. This meant that welding was no longer required. 1960 - A Steel House for Mass Production. 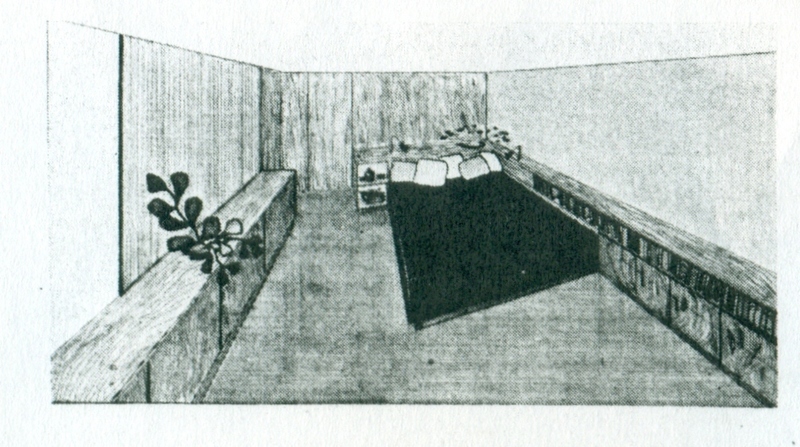 An unbuilt prototype for a design similar to the 1955 Eichler House. 1960 - The Kaneoke Estates Development, Kaneoke, Oahu HI. Residential Masterplan, unbuilt. 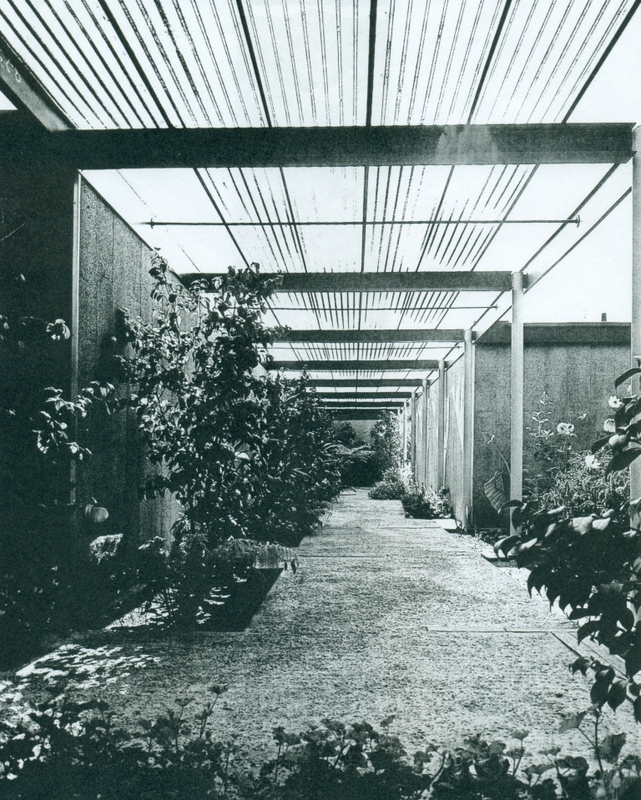 Soriano's first commssion in Hawaii was an early experiment with an aluminum building system. Eleven houses were terrraced up an 80-degree incline. The 4-bedroom homes were 1,820 square foot rectangles; 3-bedroom homes had 1,250 square feet. Both were designed with 2 baths. Soriano specified plywood siding for the solid exterior walls. 1960 - The Adolf Kiefer Apartments, 213 Third Street, Sausalito CA. Unbuilt. As with the Colby Apartments, this scheme used Soriano's steel construction system for a two-story apartment building with mulitple units, based on a 30' spanning steel frame spaced 8' apart. The project was not developed past the concept design. 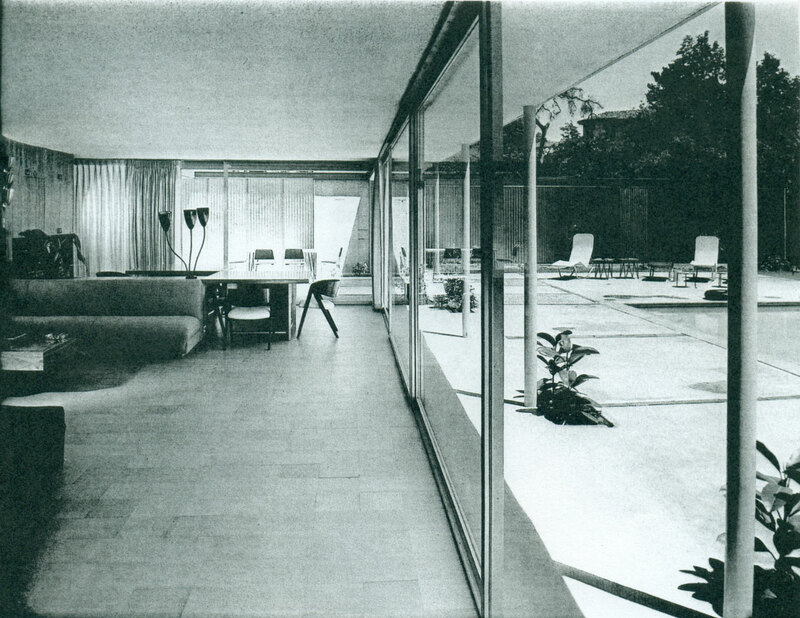 1961 - The Maurice Galante Renovation, 16 Belmont Street, San Francisco CA. Scheme design drawings were developed for an enclosure of an existing porch. Unbuilt. 1961 - The Hale Malu Apartments, Maui HI. Only a perspective sketch exists for this twelve-story apartment building in Maui. 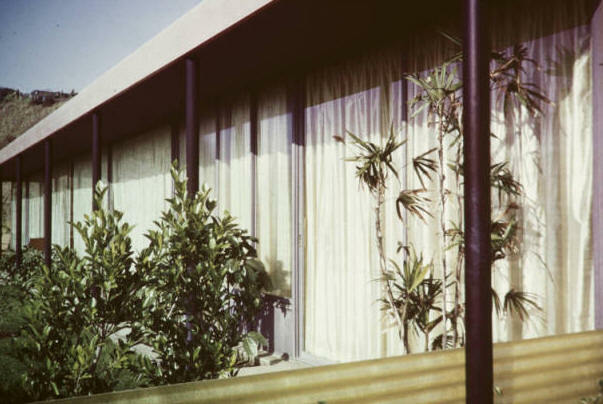 The design was similar to Soriano's design for a medical building and the Lido Hotel in Los Angeles, with ribbon windows and a strongly articulated spandrel panel. Unbuilt. 1963 - Regional Planning Prototypes. 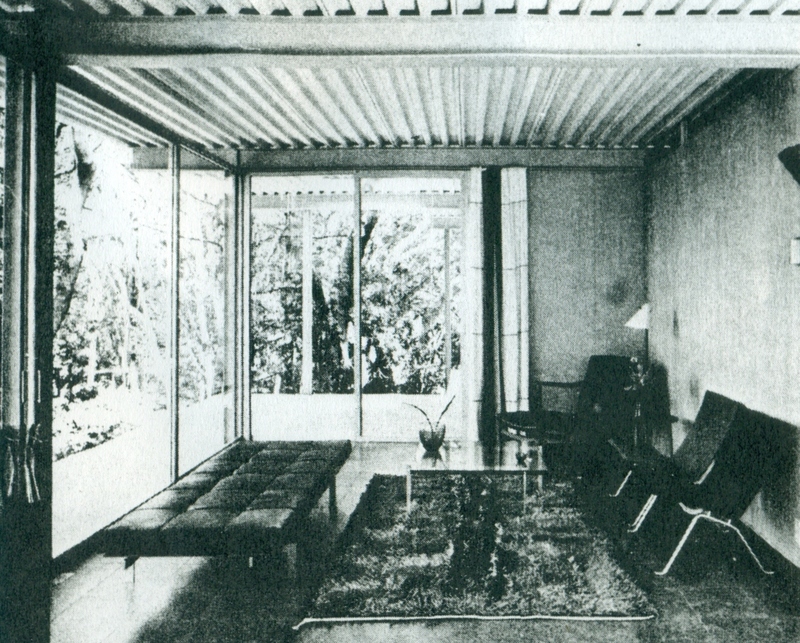 Soriano expanded his design interests from the indiviual house to regional planning. Unbuilt. This theoretical study, which he seems to have done for his own interest and without real world constraints, explored a morphology for low-density housing, ranging from a small-scale plan of forty units for a 2.5 acre site to regional planning for 5,000-person communities. These plans were intended as alternatives to sprawl. 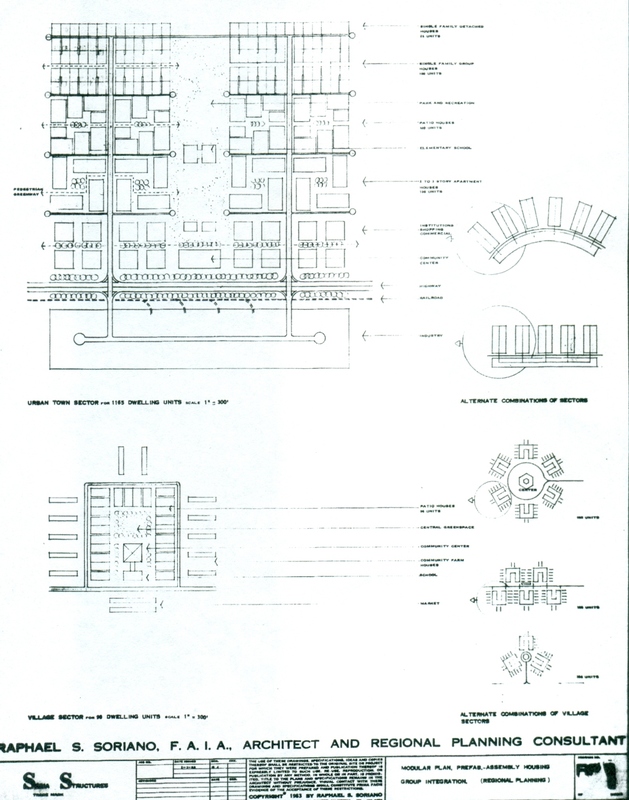 Soriano's systems approach was the basis for the planning proposals he developed during the 1960s and 1970s. 1963 - Prefab Houses for Yoshikawa Investment Co., Ltd, Wailupe, Honolulu, Oahu HI. 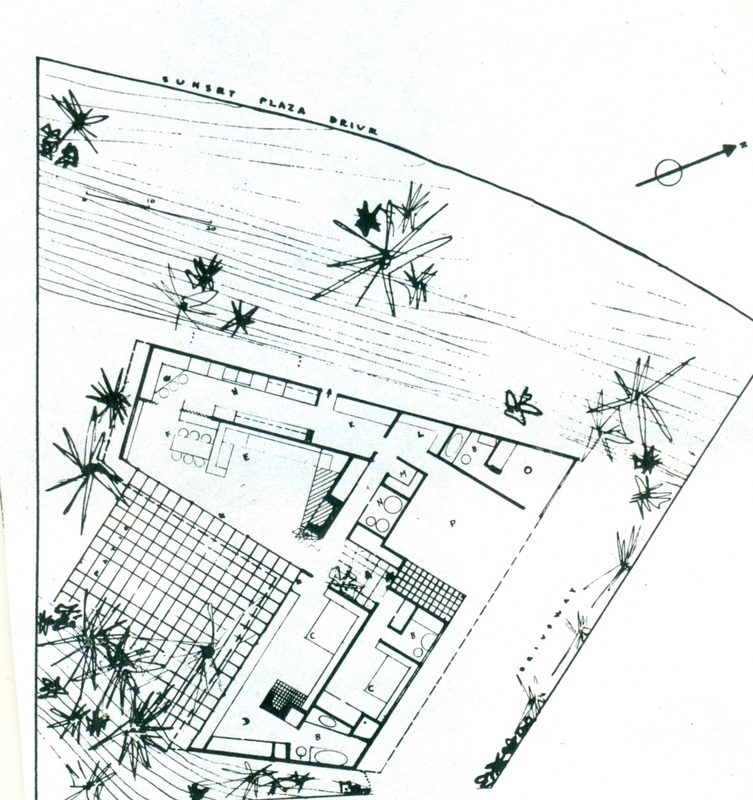 Residential Masterplan, commissioned 1962. Unbuilt. Soriano proposed his All Aluminum system for eight units ranging from 630 to 1,120 square feet. 1963 - The Affan Ataceri Houses, aka the Istanbul, Turkey. Housing Masterplan, 1963, unbuilt. The Soriano Archives contains correspondence with Turkish businessman Affan Ataceri regarding the possibility of engaging in several types of ventures, including building hotels, chain restaurants, and supermarkets. No plans or schematics of any of the possible typologies exist. It appears that Soriano originally proposed working in Turkey, building modern villages and worker housing using his All Aluminum system. 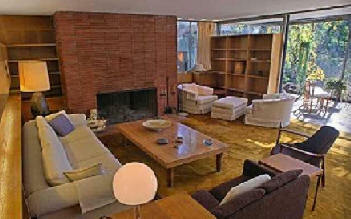 1964 - The Albert Grossman House, aka El Paradiso, 11468 Dona Cecilia Drive, Studio City CA. Commissioned 1963. 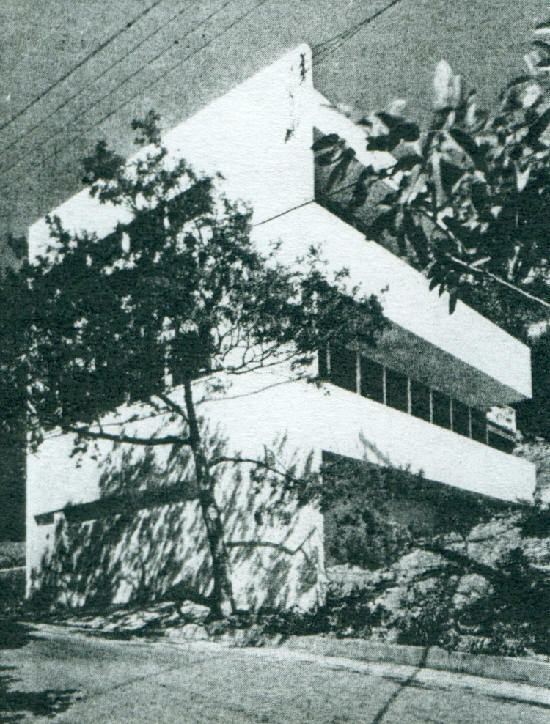 Soriano's promotion of aluminum buildings attracted the attention of Albert Grossman, whose companies sold aluminum products. 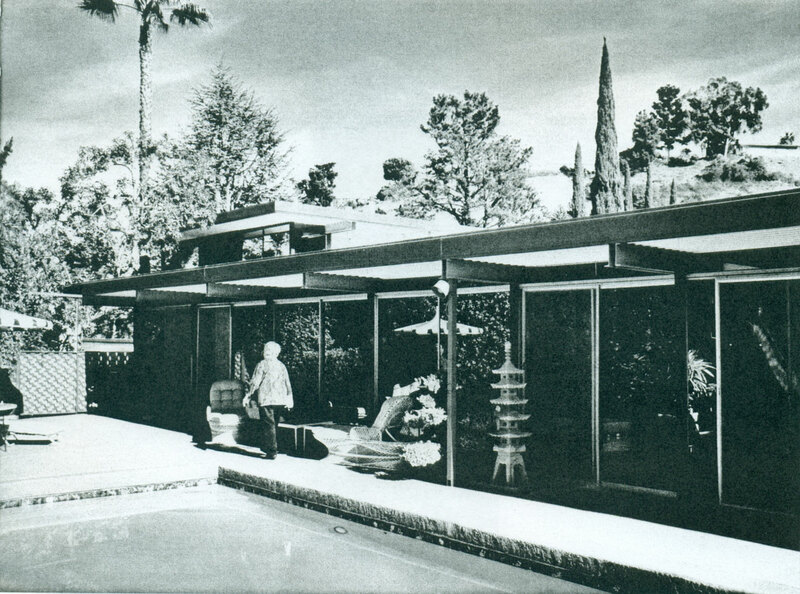 To show off his wares, Grossman agreed to build a 3,200 square foot, 4-bedroom house with ten rigid aluminum frames. Soriano walked off the job before completion but Grossman picked up where he left off. The house was designated a Cultural Heritage Monument by the City of Los Angeles in 1997. One of the few Soriano structures that remains unaltered. Color photos by Michael Locke. Sold in 2016 to Nicolai F. Pedersen. 1965 - The All Aluminum Homes for Winston T. Watanabe, Kuau Estates, Paia, Maui HI. The State of Hawaii joined forces with private industry to develop houses for families that earned too much to be eleigible for public housing and not enough to qualify for conventional home mortgages. Watanabe, a Dallas-based developer, gave Soriano the opportunity to realize his modular All Aluminum structures. Commissioned 1962. Eleven were built in the first construction phase. The factory-built, long-span aluminum frames with non-load-bearing interior walls were identical in all units, though the floor plans varied in 2- and 3-bedroom plans. Components were shipped to Hawaii from San Francisco. 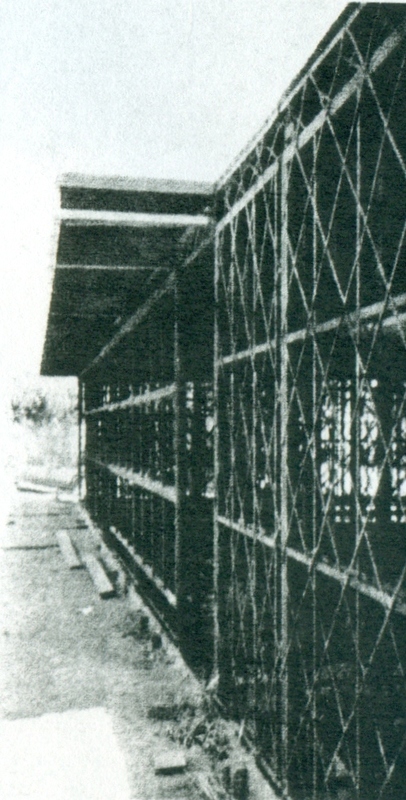 Soriano designed the system so that six unskilled men could erect a house in a single day. Because aluminum construction was new, however, and Soriano could not directly supervise the process, construction mistakes were made. Phase two was never started. According to Mona Grigg, who lived in one of the houses, "the locals called the subdivision “Easter Egg Village” because each of the houses was a different pastel color. The interiors were Micarta, walls and all, with hidden push-hinges on all cupboard and closet doors. No knobs or handles anywhere." All were destroyed. The location became the site of Mama's Fish house in Paia, one of the island's most popular restaurants. 1965 - The La Marina Development, Calle de Servicio, Puerto de Ensenada, Baja, CA, Mexico. Unbuilt. Masterplan for a 375,000 square foot site. A 750' wide pier accommodated a 260-room hotel, yacht clubs, retail shops, parking, and luxury apartments. 1966 - The Soria Structures. Soriano began working in 1962 on modular All Aluminum buiding systems for low-cost housing, schools, and commercial applications. 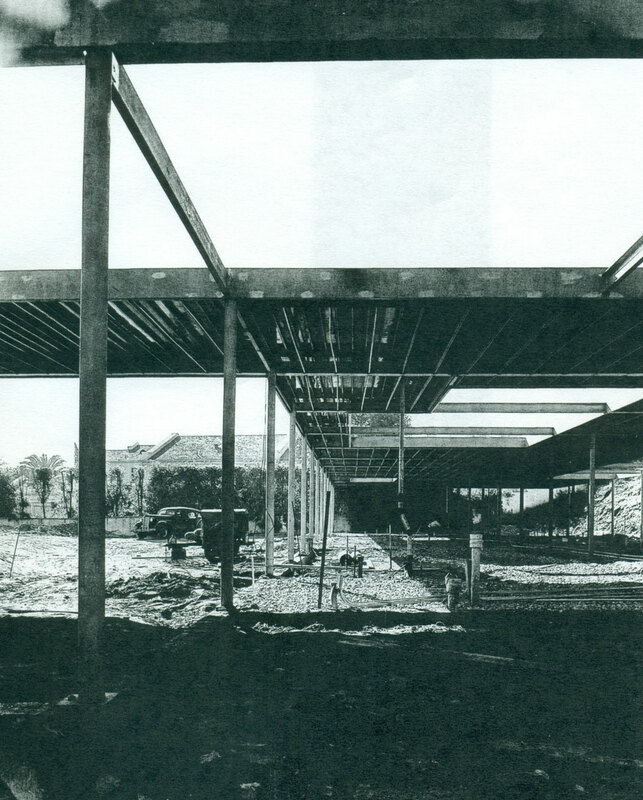 In January 1965, he filed for trademark on the name for plans and blueprints for pre-fabricated modular buildings. The United States Patent Office granted the trademark registration in 1966. Soriano founded Soria Structures, Inc., in Dallas, to market his system worldwide. 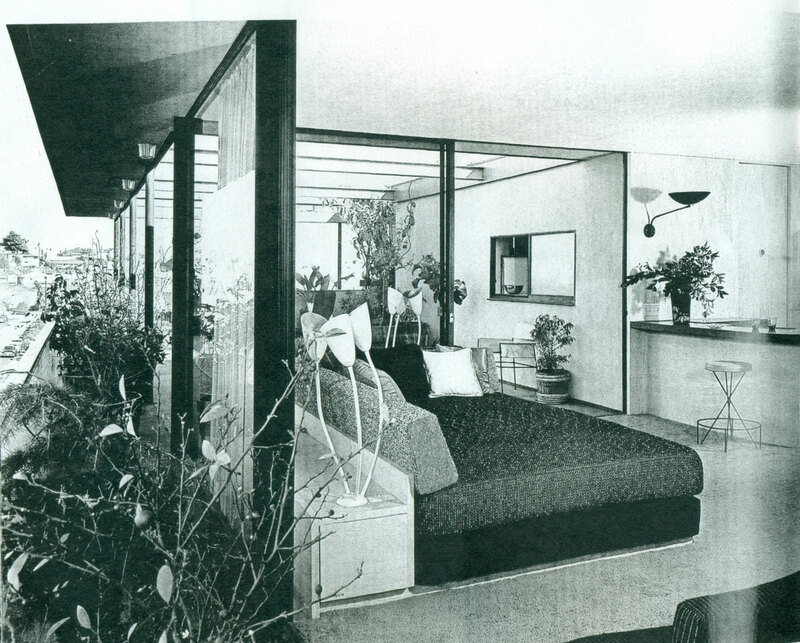 Sadly, the only built applications were the eleven All Aluminum Homes in Hawaii and the 1964 Grossman House. Soriano also explored a joint venture with Alcoa. Although he had a close relationships with Alcoa president Jim Close, the proposed partnership did not get off the ground. 1966 - Stanford Court Apartments for A. Cal Rossi, Powell and Pine Streets, San Francisco CA. Unbuilt. Rossi, a developer in San Francisco, had originally hired Soriano to design an office tower based on his All Aluminum structure, in place of a 100,000 square foot apartment building. When the FHA questioned the height of the proposed building, the city planners refused the plan and the existing apartment house was eventually remodeled. Soriano was asked to do a remodel concept. 1968 - Punch Bowl Estates for Jack Park, Punch Bowl HI. Residential Masterplan, unbuilt. 27 terraced units on a hillside using the Soria Structures building system. 1968 - The Westport Beach Development, Alaska State Housing Authority, Alaska. Regional Planning, unbuilt. Soriano cojsulted on adapted Soria Structures - specifically whether the aluminum houses would meet HUD's requirements for low-rent projects and the cold climate. 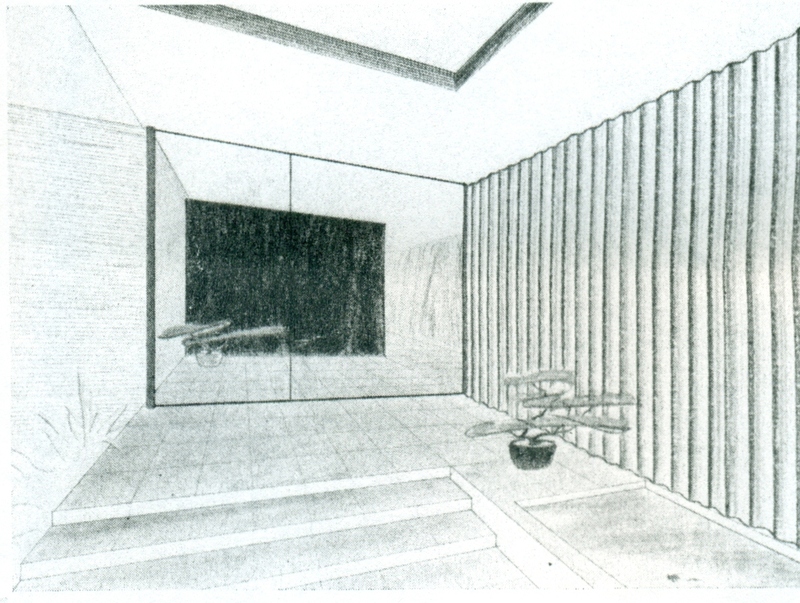 Soriano proposed his 500, 700, and 1,000 series homes without patios, with thermal glass fro the exterior walls. 1970 - The Morton Harris House, Rodeo Drive, Beverly Hills CA. Unbuilt. 50' x 65' house with a large kitchen, dining room, library, master bedroom with dressing room and bath, and one guest room with bath. 1970 - Kings County Housing, Kings County. Unbuilt. This site plan was for a development of 300 pre-fabricated All Aluminum houses, to be built over 3 years. Each unit would have measured between 500 and 1,100 square feet and contained one- to four-bedrooms. Banks refused to fund the project because of Soriano's unusual design. Around 1970 - The Tagawa Apartments, location unknown. Unbuilt. Rough sketches of this multi-story application of the Soria Structures show a two-story steel construction floating over on-grade parking. Apartment units were either 760 square feet or 1,560 square feet. Around 1970 - The Richmond Model Cities Program for Ted Burton, Richmond CA. Unbuilt. 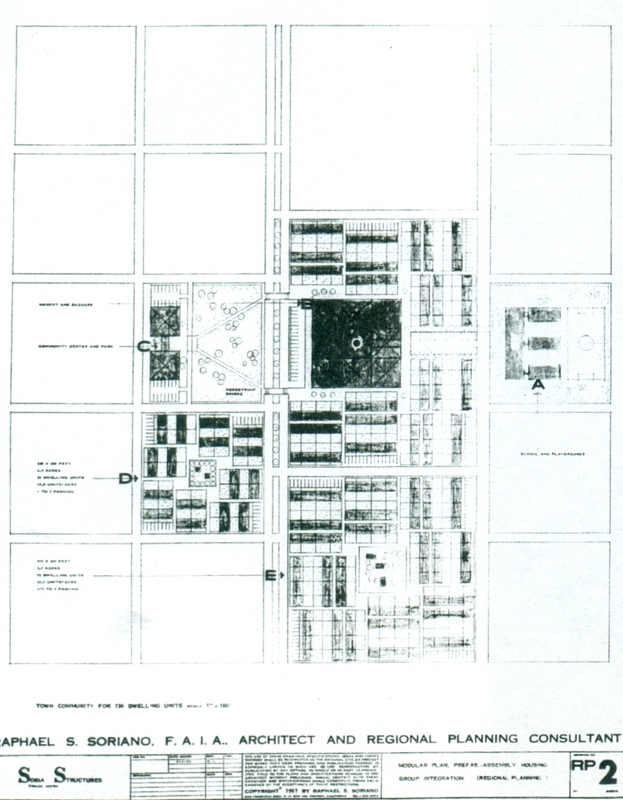 A Soria-based masterplan for Richmond VA.
1971 - The Richard Hines Jr. House, Gainesville FL. Residential masterplan, unbuilt. Used refabricated aluminum structures designed to withstand hurricane-force winds. 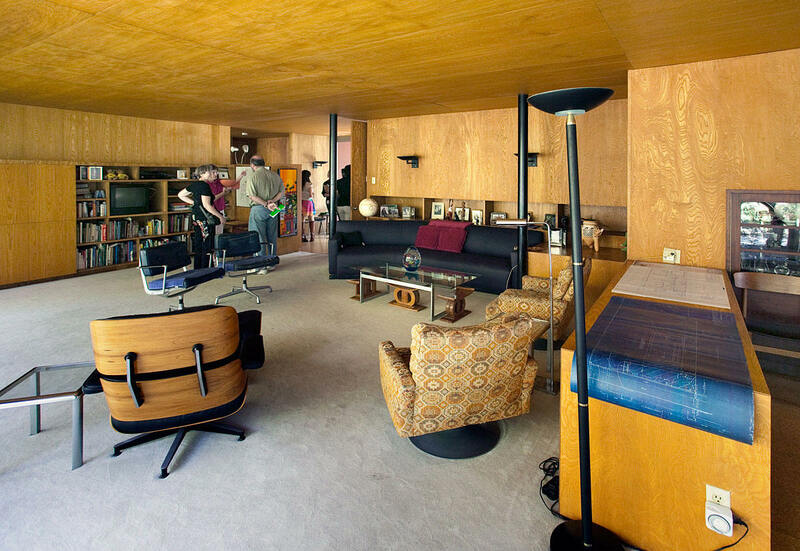 1973 - The Lloyd Rigler house, Los Angeles CA. Unbuilt. Soriano's friend and patron asked him for a concept design. 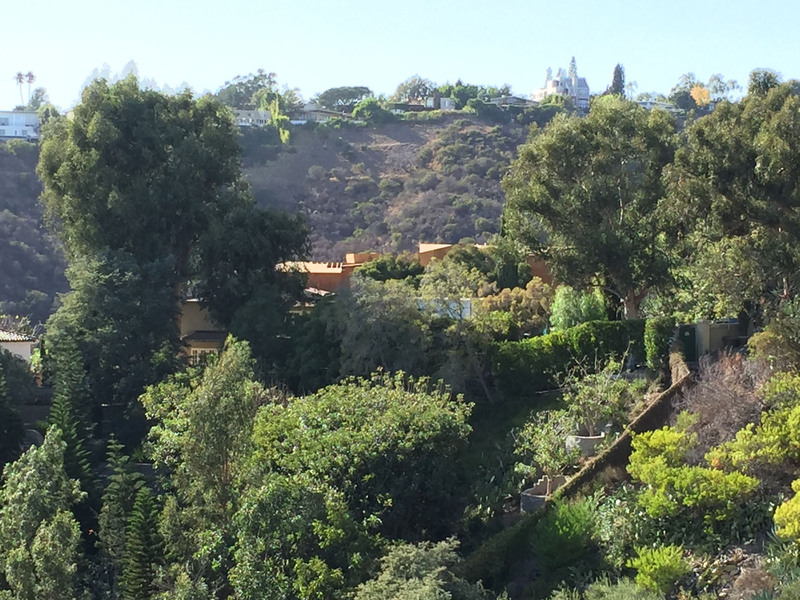 The spectacular Hollywood Hills site offered a 360 degree panoramic view of Los Angeles and the San Fernando Valley. 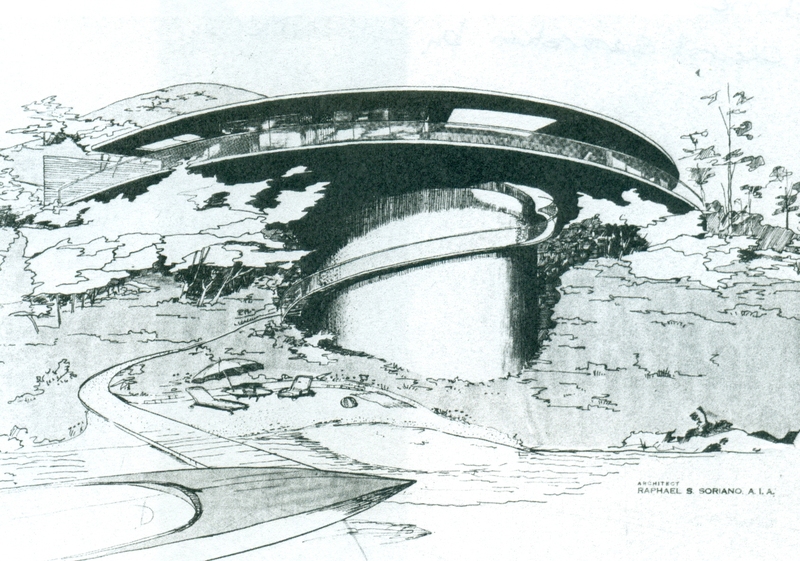 1973 - The Allegro Circle Estates for Olav Norman, Tiburon CA. Unbuilt. 26 to 38 single-family, All Aluminum Homes on approximately 15 acres with a swimming pool, two tennis courts, and a recreational play area situated around an existing two-acre residence. Had several round houses in the plan. 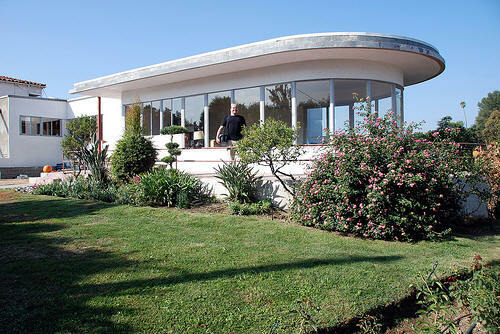 1973 - The Soria Circle for Marco Radomile, aka Villa Moderne, Tiburon CA. Commissioned 1972. Eight single-family aluminum houses in one- and two-story structures. First floor configurations fluctuated according to the underlying slope of the compact site. The buildings measured approximately 1534 sf each. Unsure if built. 1975 - The Helsinki Homes for Oy Lemminkainen, Helsinki, Finland. Commissioned 1971. Unbuilt. Single-family development for Lemminkainen, a highway contractor in Finland. Soriano supplied information on his Soria Structures, trying to estimate the cost of supplying the aluminum house for consideration. 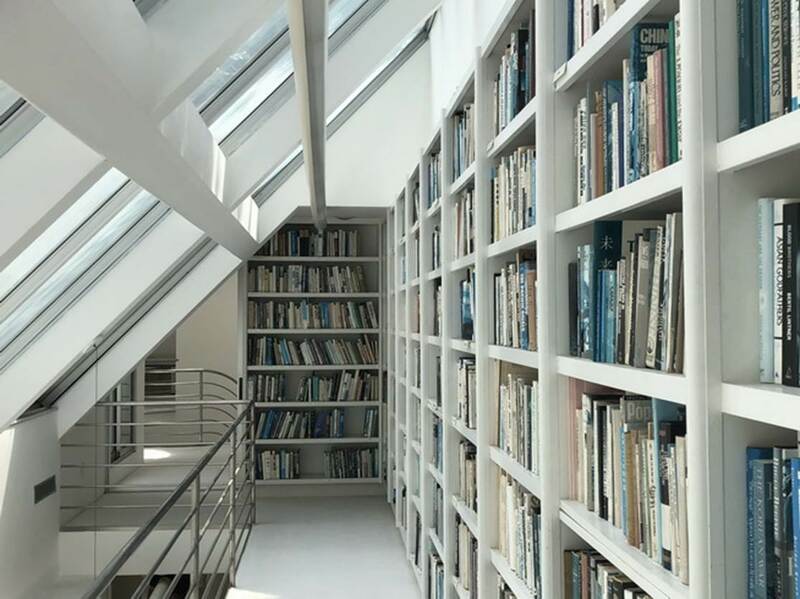 Sources include: Soriano by Wolfgang Wagener, Architectural Record, Marvin Malecha, Arts and Architecture Magazine.